The roots of Newark begin in 1758 as a small market village at the crossroads of two old Indian trails in northwestern New Castle County. 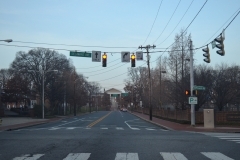 The founding of what would later become the University of Delaware occurred in 1765 as a small grammar school. 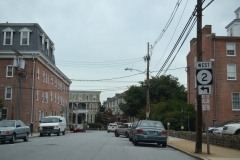 In 1837, the Philadelphia, Wilmington and Baltimore railroad opens through Newark. By 1852 700 residents called Newark home with that figure doubling by 1900 with the arrival of railroads and industry. 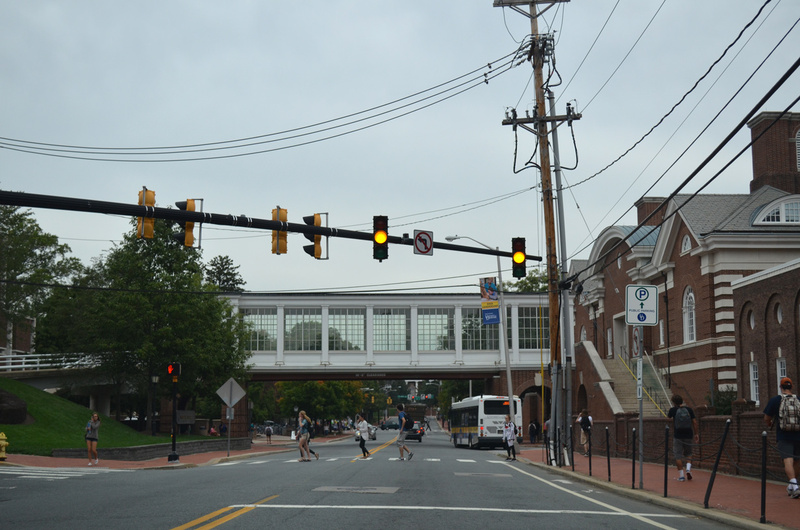 In 1921 Delaware College and the Women’s College of Delaware combined to form the University of Delaware. 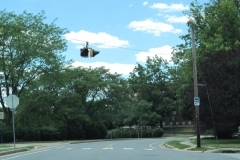 The university remains today the main economic force driving the city of Newark. 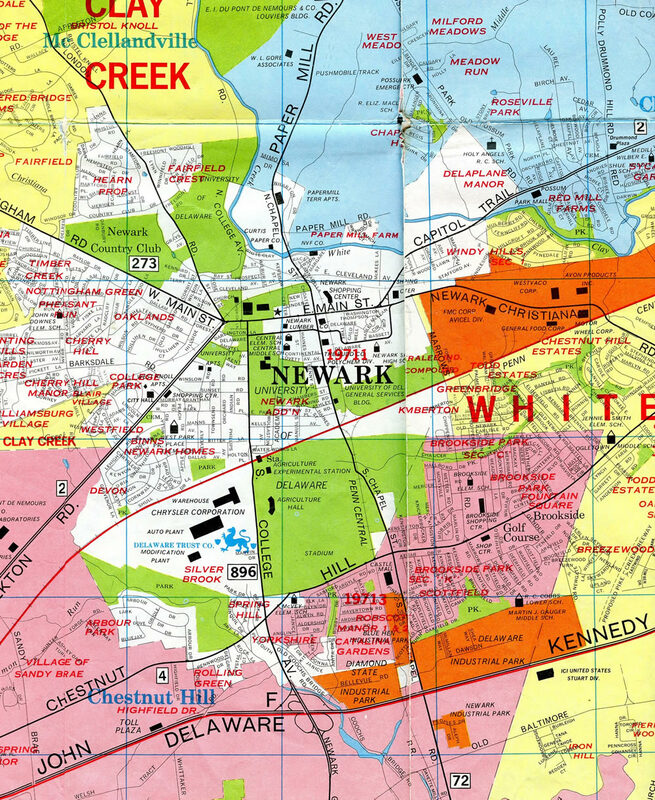 Other industries to call Newark home included the 1853-opened Curtis Paper Company along Paper Mill Road and the DelChapel Plant along South Chapel Street. 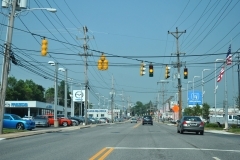 The Chrysler Corporation opened a defense assembly plant in south Newark by 19511, which transitioned to automobile assembly in 1957. 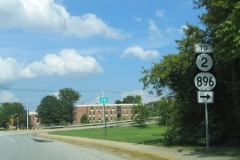 The Newark Assembly Plant operated until 2009. 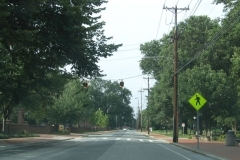 The site is now a part of an expanded University of Delaware campus. During that time period the cosmetic makeup of the city underwent a massive change. 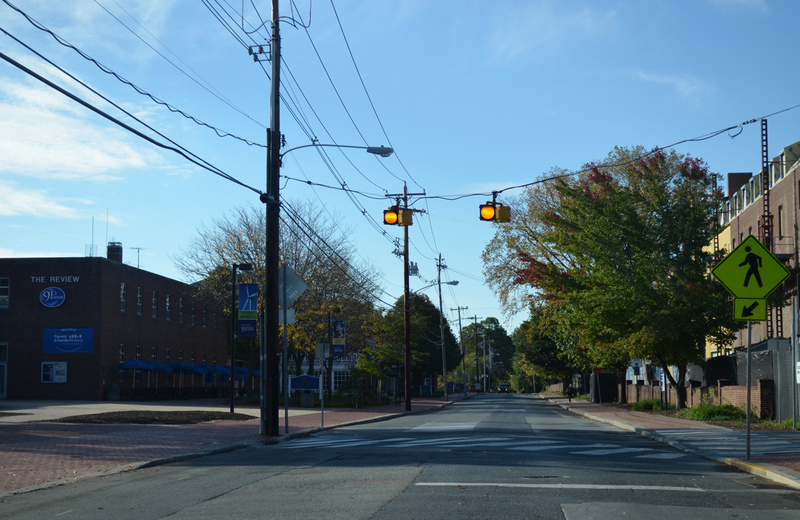 Disappeared were the farmers market, mom and dad shops, and the small town atmosphere. 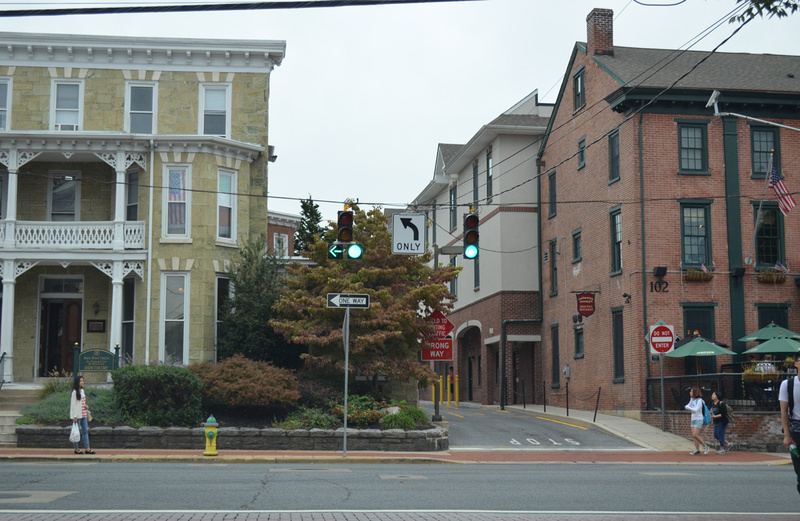 Those amenities dissolved in the 1980s, leading to a short period of economic transition for the city. 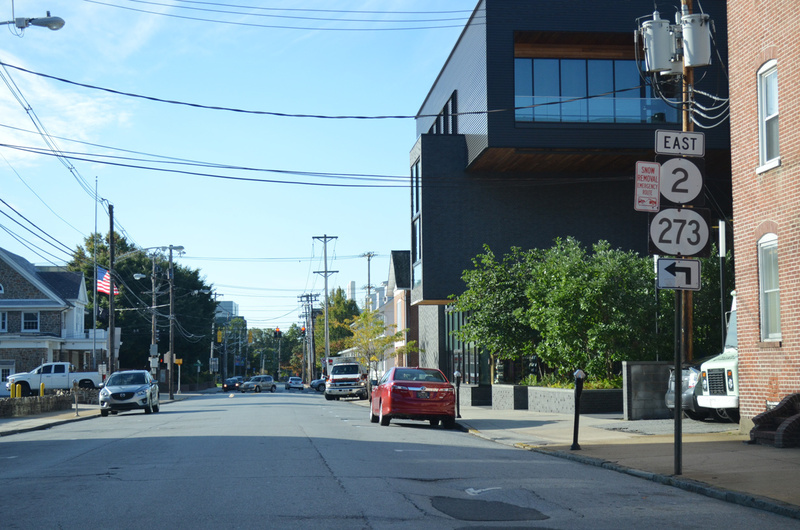 During the 1990s the business landscape of Newark, and Main Street in particular, underwent a metamorphosis that ultimately renewed the Downtown area as a place to visit, shop, dine, and party for college students and locals alike. 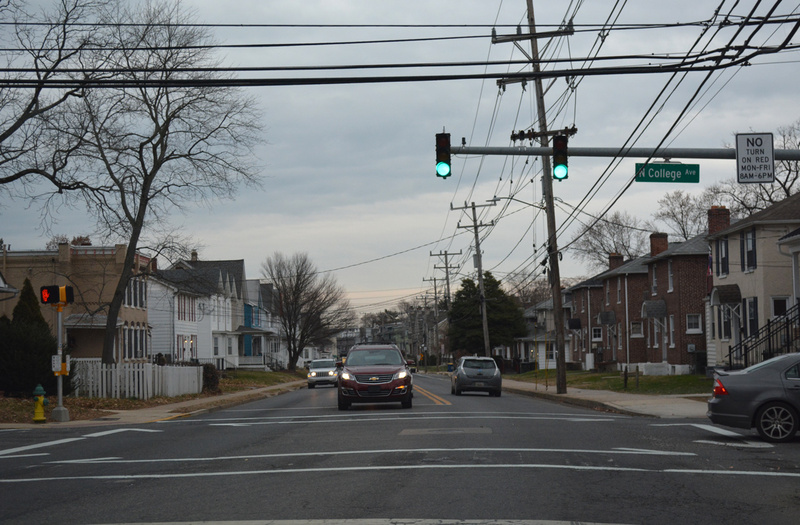 Gone are the Newark Mini Mall, Woolworth, and the State Theater. 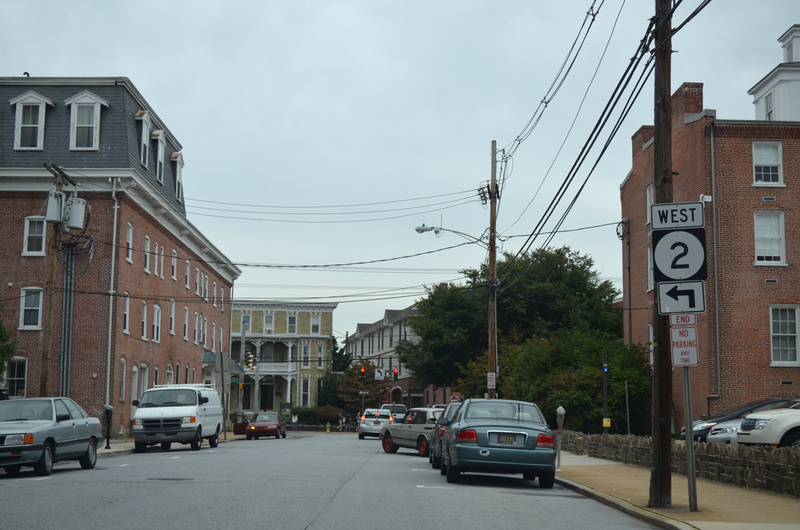 Redevelopment of the city instead focused on places like the Main Street Galleria, Iron Hill Brewery, and several mixed-use developments with shops on the ground floor and apartments above. 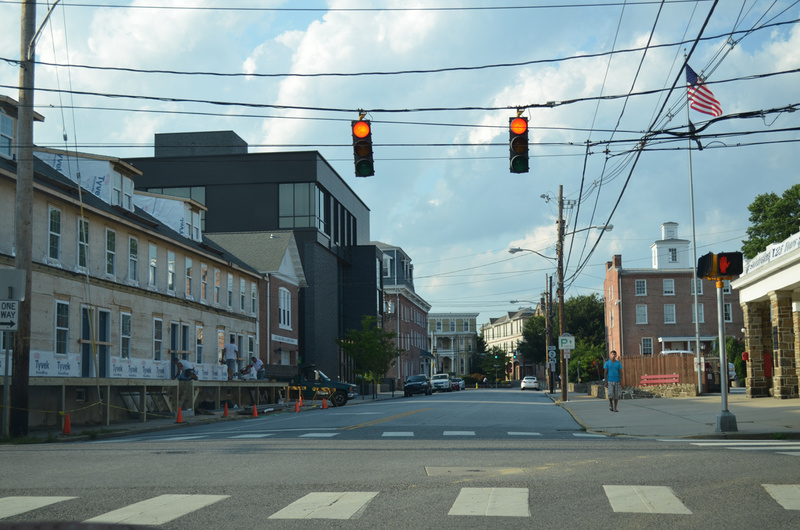 The Newark of today continues to grow with redevelopment of existing parcels and in-fill development of remaining passive tracts. 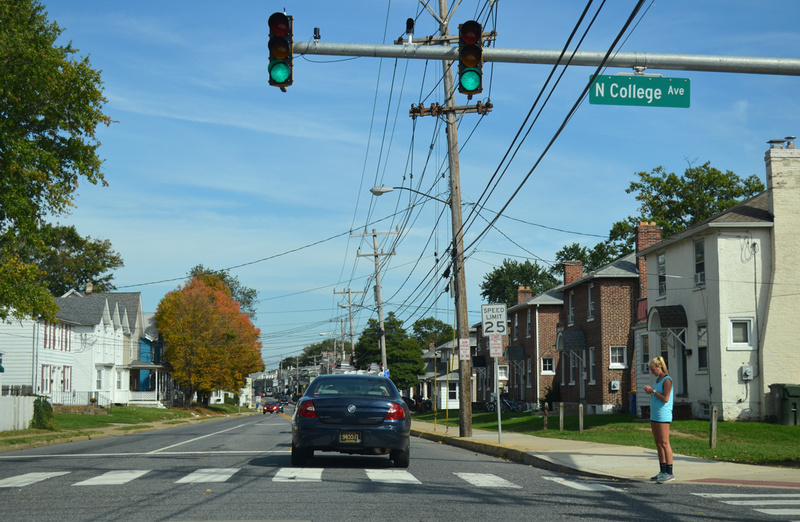 Congestion woes continue to be a problem, with a mix of traffic emanating from college students, residents, and commuters alike. 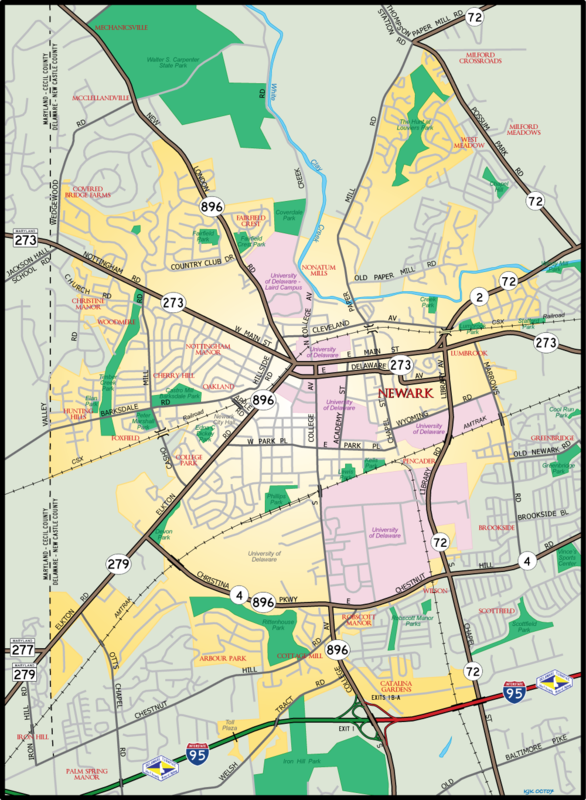 As of 2010 the city is home to 31,454 residents including the University on-campus population. 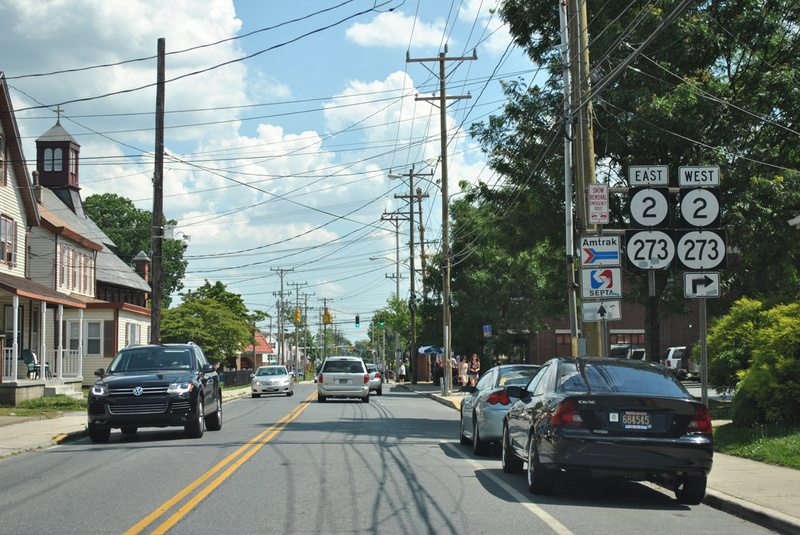 State Route 2 originates at the intersection of SR 72 (Library Avenue) and SR 273 (East Main Street) in east Newark, following Capitol Trail east by the Windy Hills subdivision to exit the city at White Clay Creek. 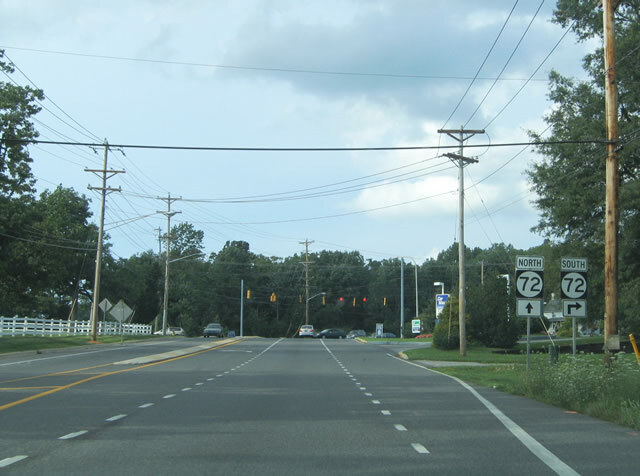 The state route overlaps with SR 72 from SR 273 to Possum Park Road before traveling solo toward Wilmington. 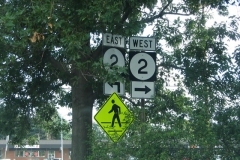 Historically SR 2 extended west through Newark along a combination of the couplet between Main Street (west) and Delaware Avenue (east) to Elkton Road. 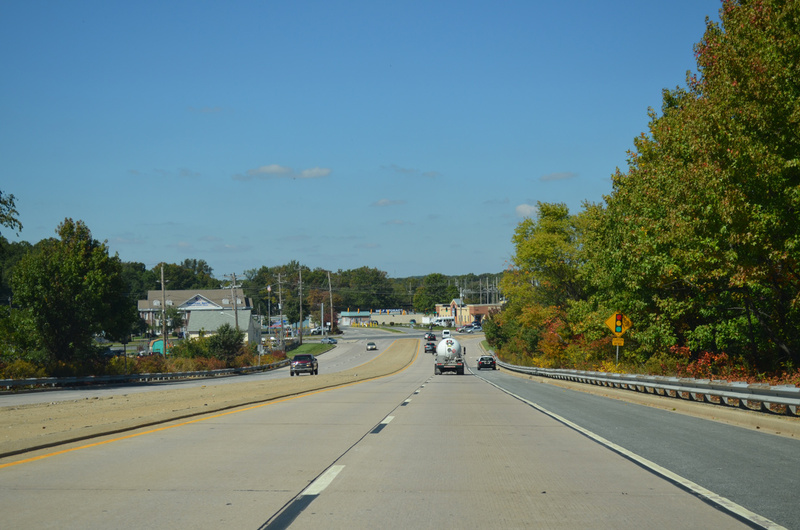 The state route transitioned to Maryland 279 at the state line en route to Interstate 95 (Exit 109) and Elkton. 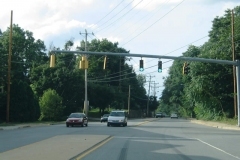 A change was made to the SR 2 alignment in 1988, sending the route along Christina Parkway east to Chestnut Hill Road (SR 4). 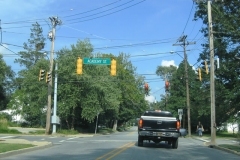 The relocation was made to reroute through traffic away from the central business district and University of Delaware campus. SR 2 was redirected onto Christina Parkway along side SR 4, Chestnut Hill Road (SR 4) between SR 896 (South College Avenue) and SR 72 (South Chapel Street) and an overlap with SR 72 north to Library Avenue to Capitol Trail. The former alignment through Downtown was redesigned as SR 2 Business. 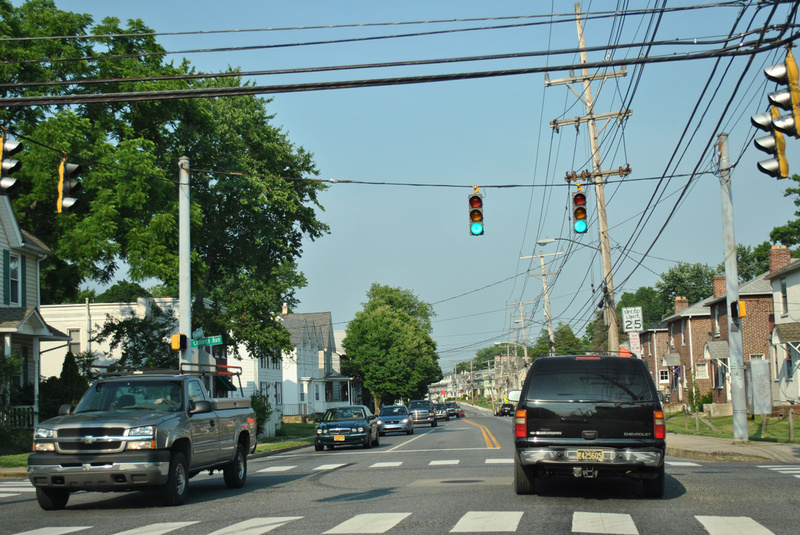 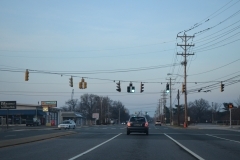 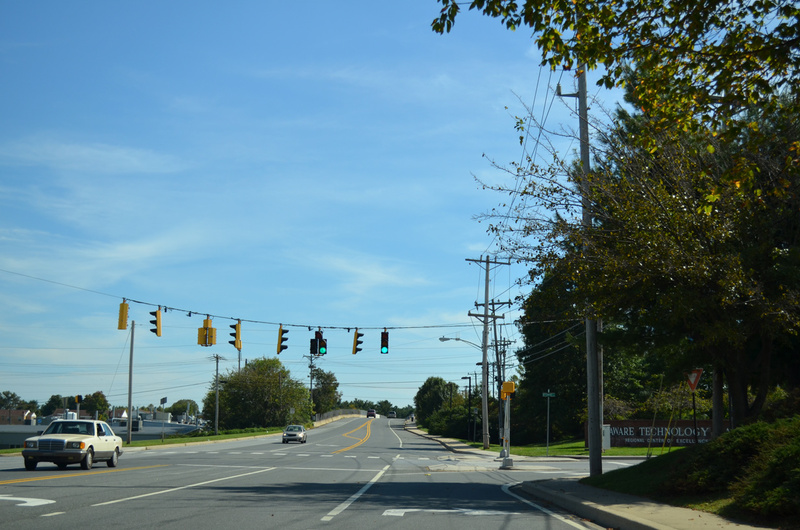 Changes to State Route 2 occurred again in fall 2013 when DelDOT moved forward on a plan to truncate SR 2 east from the state line to Library Avenue at East Main Street. 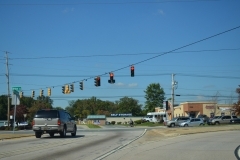 This coincided with both the removal of SR 2 Business through Downtown and the establishment of SR 279 along the 1.05-mile stretch of Elkton Road leading west from Christina Parkway (SR 4). 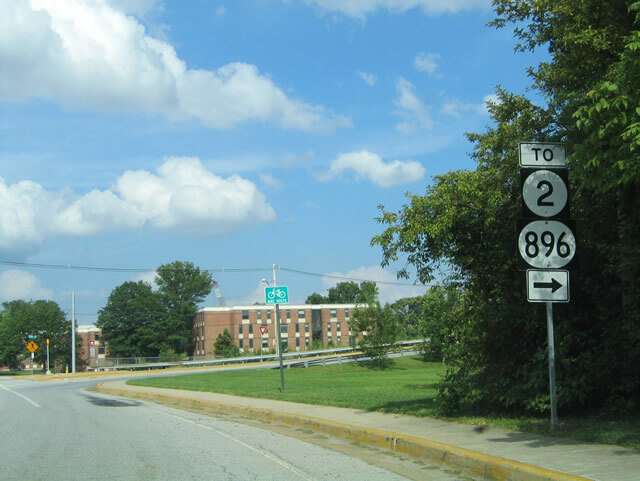 The renumbering was conducted to simply the Newark state route network. 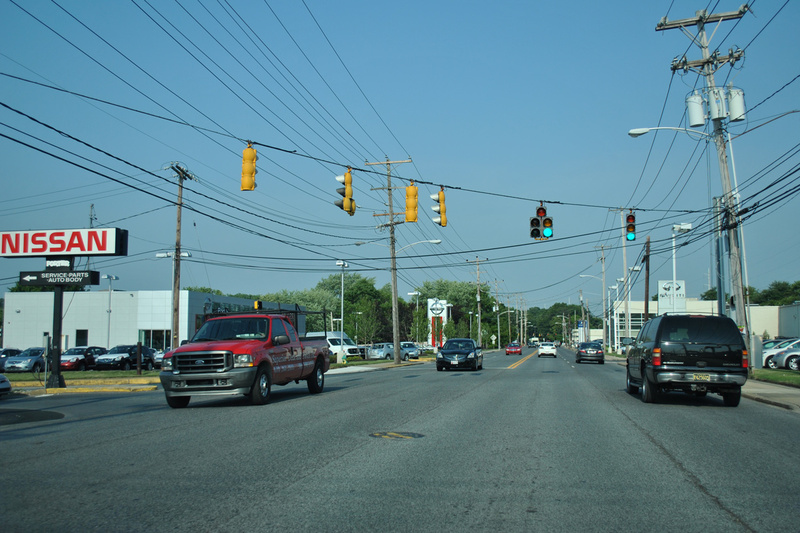 Delaware 2 Business supplanted Delaware 2 through Newark between Delaware 4 (Christina Parkway) and Delaware 72 (Library Avenue) in 1988. The state route followed Elkton Road northeast from Delaware 2, along side Delaware 896 north, to the outskirts of Downtown Newark. There Delaware 2 Business & 896 joined Delaware 273 along the one-way couplet of Main Street (westbound) and Delaware Avenue (eastbound). 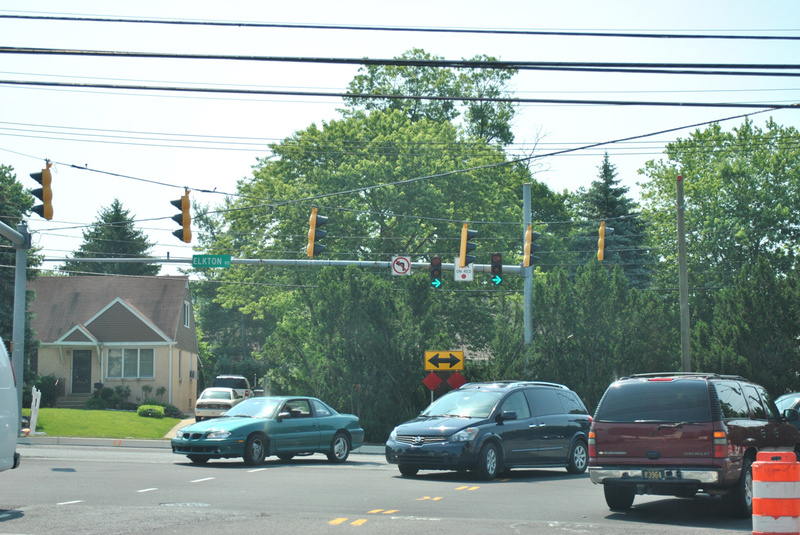 Delaware 896 leaves the overlap at College Avenue as Delaware 2 Business & 273 eastbound continued to Delaware 2 & 72 (Library Avenue) where the business route ended. 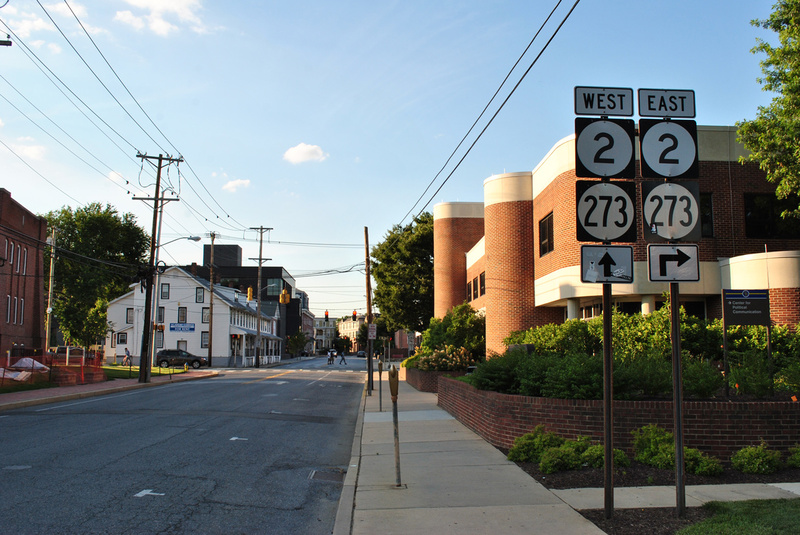 Delaware 273 east turns northward from Delaware Avenue onto Library Avenue (Delaware 72) to rejoin its westbound component at the intersection of East Main Street and Ogletown Road. 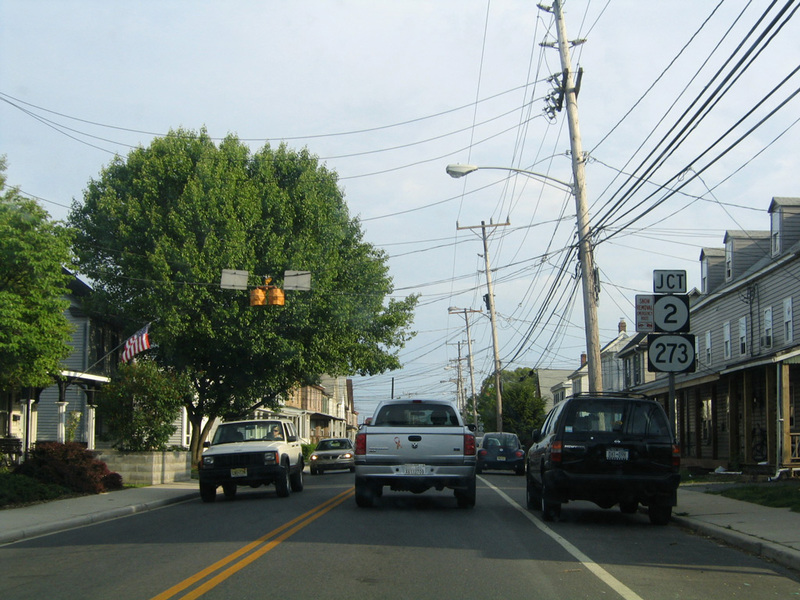 Delaware 2 Business westbound began at the same intersection, coinciding with Delaware 273 west along Main Street to Elkton Road (South Main Street). 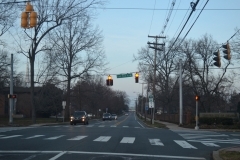 Elkton Road was renamed South Main Street between West Park Place and West Main Street officially on January 1, 2013. 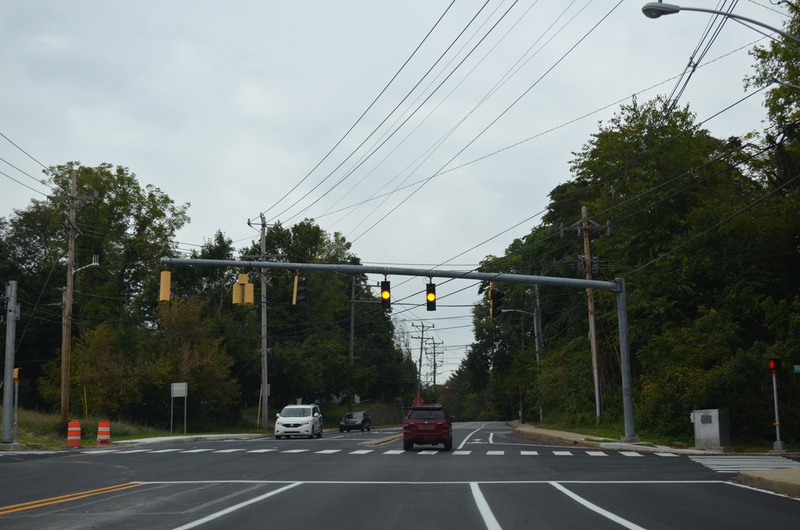 The new name accompanies the new look of Elkton Road, which was reconstructed from a four-lane arterial into a two-lane boulevard east of Apple Road. 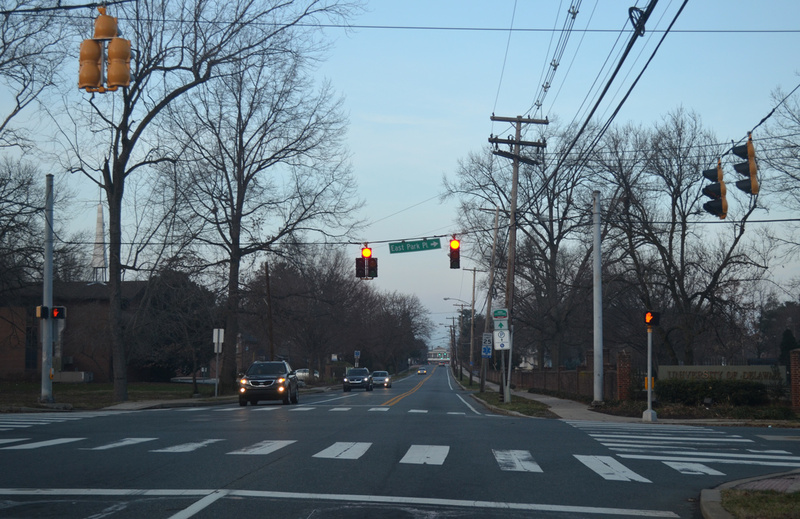 These moves preceded the Newark renumbering plan in fall 2013 that eliminated Delaware 2 Business. Delaware 4 between Newark and Wilmington was the second alignment posted for the state route in Delaware. It was posted during the 1960s along Chestnut Hill Road east from the Maryland state line to Ogletown and points east. 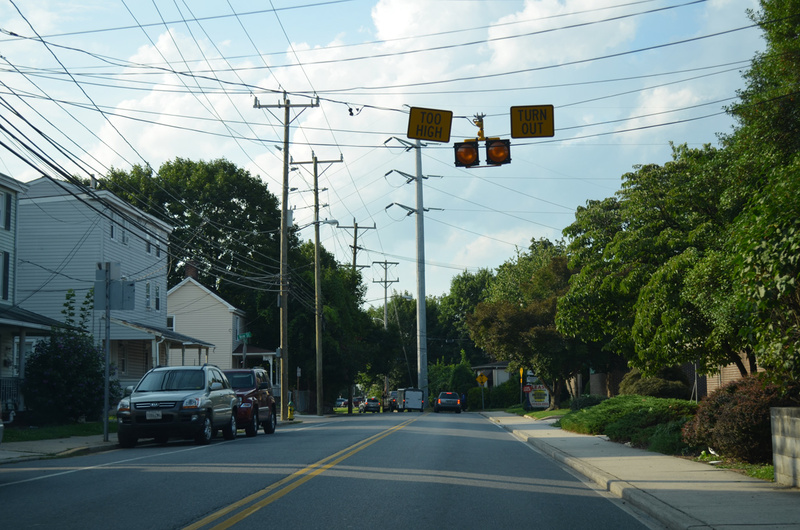 Chestnut Hill Road originally ran west to become a part of Maryland 279 to its former alignment along Appleton Road into Elkton. 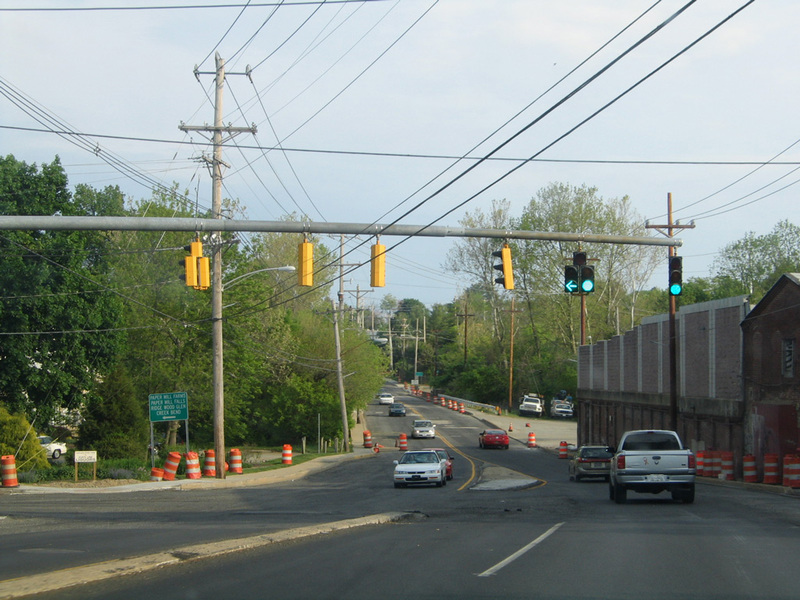 Construction of Maryland’s Northeastern Expressway (Interstate 95) in 1963 severed Chestnut Hill Road between Elkton Road and Iron Hill Road near state line. 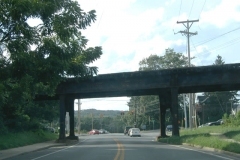 Previously an overpass crossed the AMTRAK corridor there. 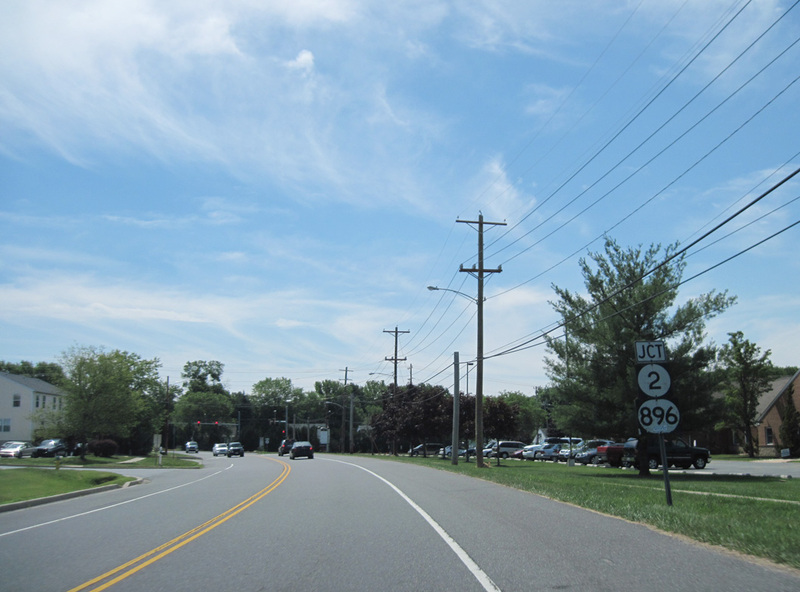 Chestnut Hill Road carried all of SR 4 south through the Newark area until 1985, when Christina Parkway was completed between Elkton Road (SR 2) and South College Avenue (SR 896). 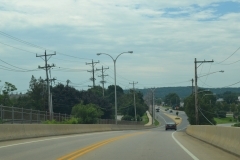 The new Christina Parkway shifted the state route onto a new northerly alignment starting at SR 2, one mile from the state border. 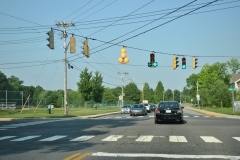 Christina Parkway carries four overall lanes with the exception of a two-lane span across the AMTRAK Northeast Corridor. 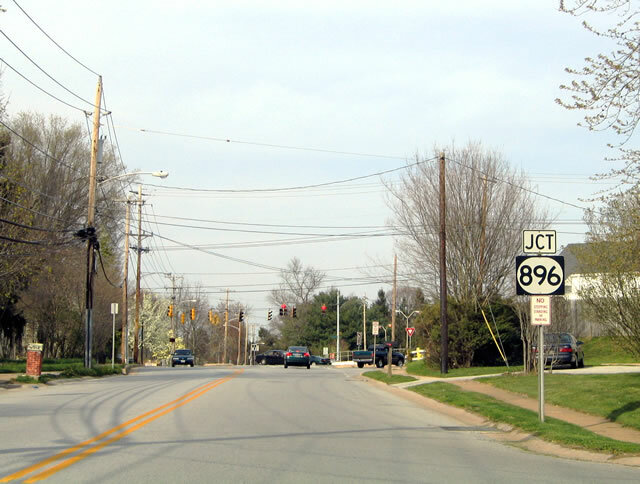 Delaware 896 joins Delaware 4 along the 1.4-mile road, completing a bypass of the University of Delaware campus from Elkton Road to South College Avenue. 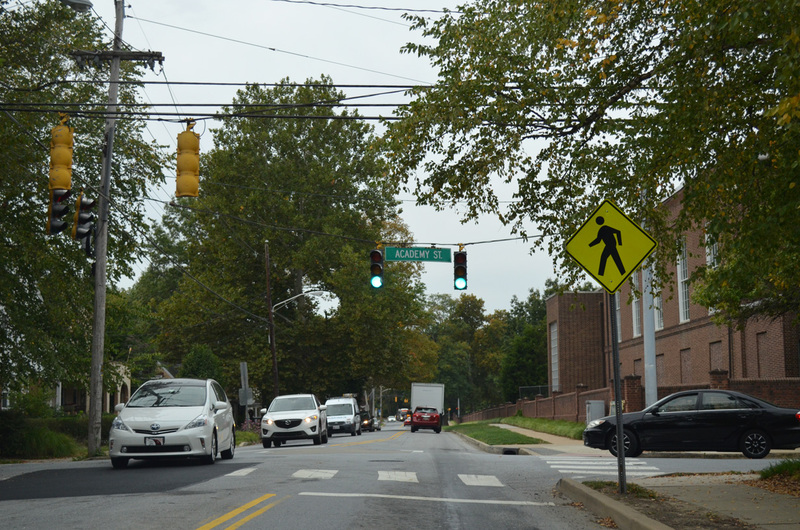 East from there, Christina Parkway transitions to Chestnut Hill Road in name, overtaking the original two-lane alignment east to unincorporated Brookside. 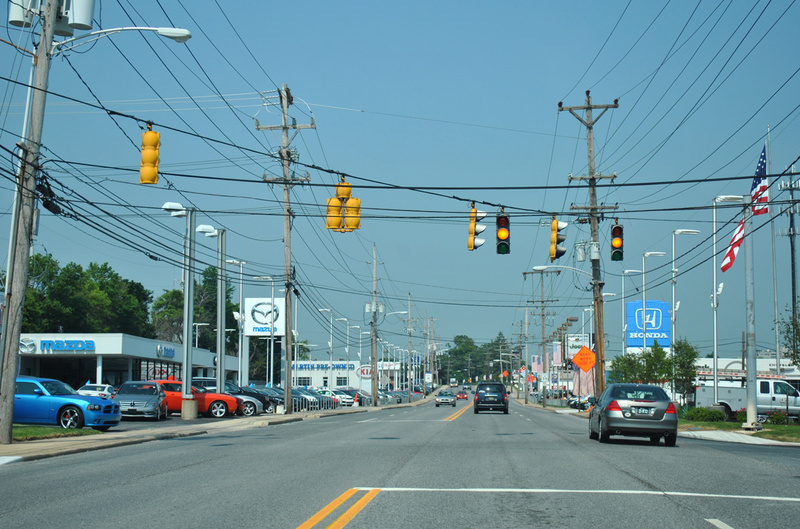 Between 1988 and 2013, Delaware 4 doubled as Delaware 2 east from Elkton Road to Delaware 72 (South Chapel Street). 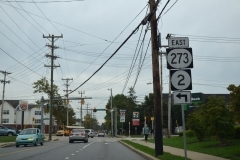 Delaware 72 originally followed Paper Mill Road 2.1 miles southward from Possum Park Road to the intersection of Cleveland Avenue and North Chapel Street in Newark. 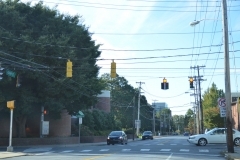 The state route continued southward along Chapel Street 1.4 miles to the rural intersection of Library Avenue and Old South Chapel Street. 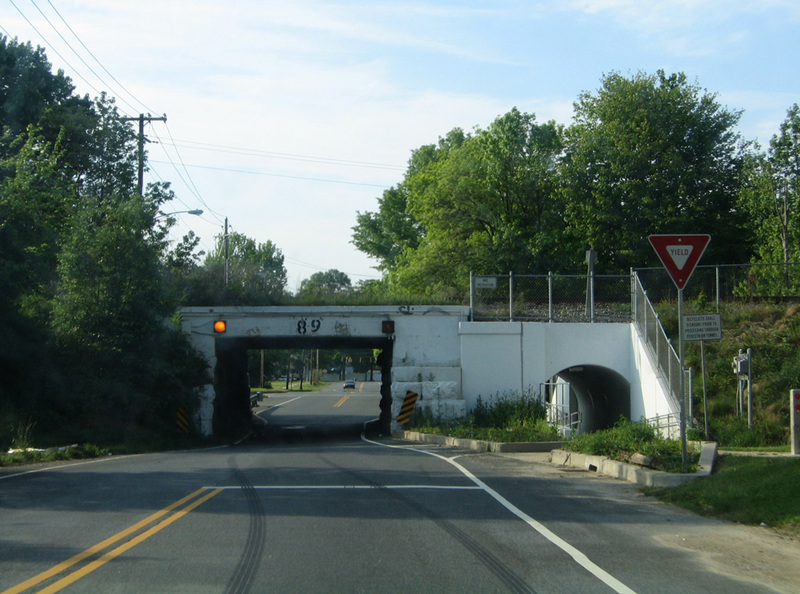 In 1972 as part of a statewide project to eliminate at-grade railroad crossings, a new alignment of Delaware 72 was constructed to bypass the AMTRAK railroad crossing to the east. 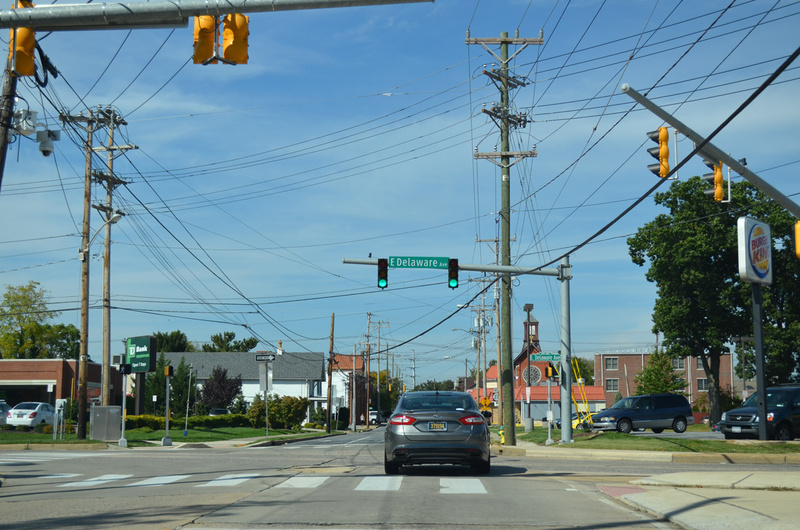 Known as Library Avenue, the new roadway branched northeast from South Chapel Street to span the railroad to Wyoming Road and Delaware Avenue (Delaware 273 east). 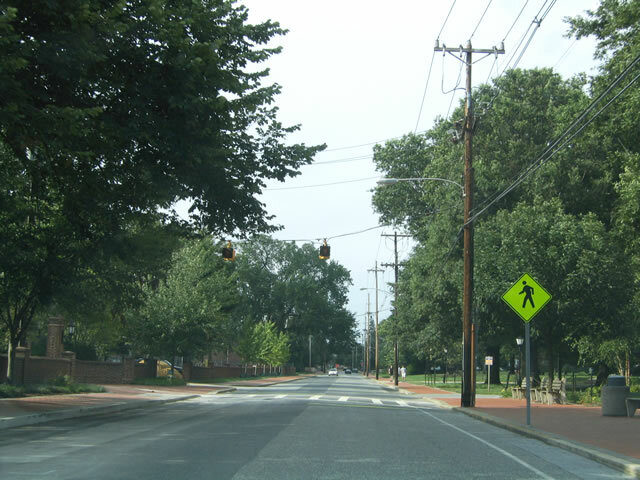 Coinciding with the road work was the creation of Wyoming Road between South Chapel Street and Library Avenue. 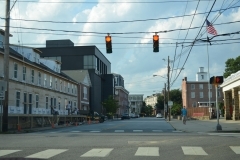 Upon completion of the project, Chapel Street became discontinuous between East Park Place and a point one half mile to the south. 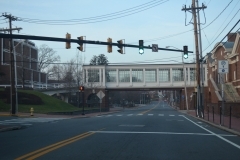 With the completion of the AMTRAK overpass and Library Avenue, Delaware 72 was relocated away from Paper Mill Road and Chapel Street through central Newark. North from Library Avenue, Delaware 72 joins Delaware 2 east along Capitol Trail to Possum Park Road outside the Newark city limits. 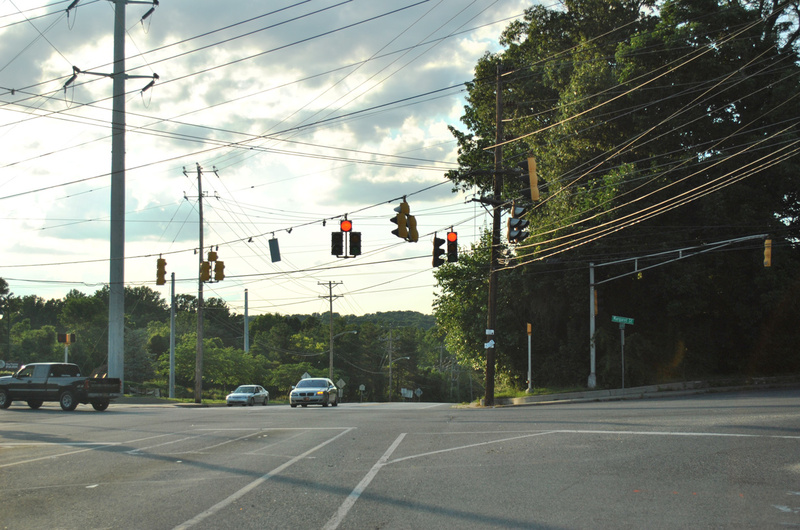 Possum Park directs the route northwest 1.9 miles back to Paper Mill Road at Thompson State Road. 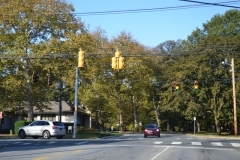 Southward from Library Avenue and South Chapel Street, Delaware 72 intersects Delaware 4 (Chestnut Hill Road) before exiting the city en route to Wrangle Hill and Delaware City. Delaware 273 is the last state route through Newark to remain on its original alignment. 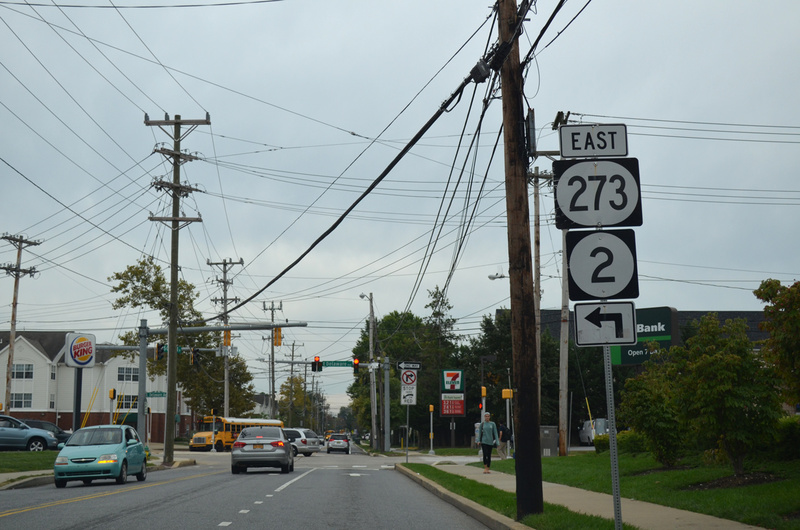 Forming a multi-state route with Maryland 273 east from Rising Sun, Delaware 273 follows Nottingham Road through northwest Newark. 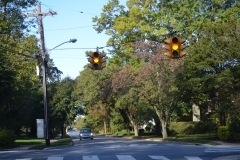 The two-lane road undulates by some of the nicer residential areas of the city, including the rolling greens of Newark Country Club. 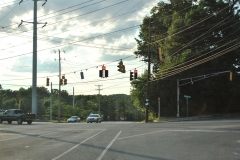 Nottingham Road intersects Casho Mill Road, a secondary north-south road between Delaware 273 and Elkton Road, at the base of the Christina River valley along side Timber Creek Park. East from there Nottingham Road ascends to the intersection of Bent Lane where Delaware 273 becomes West Main Street. SR 273 (West Main Street) joins SR 896 south at Hillside Road, 1.7 miles from the Maryland state line. 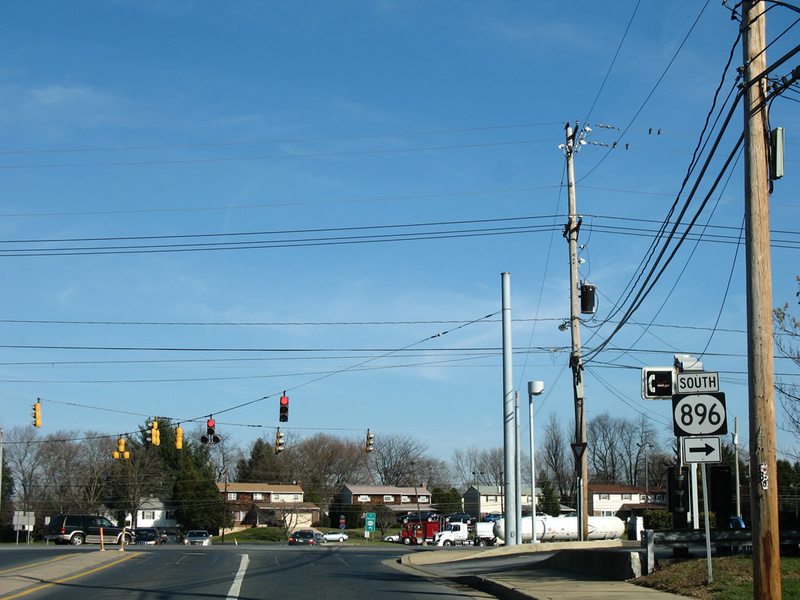 SR 896 south overlaps with SR 273 between the intersection of Cleveland and Hillside Avenues to the east end of South Main Street. 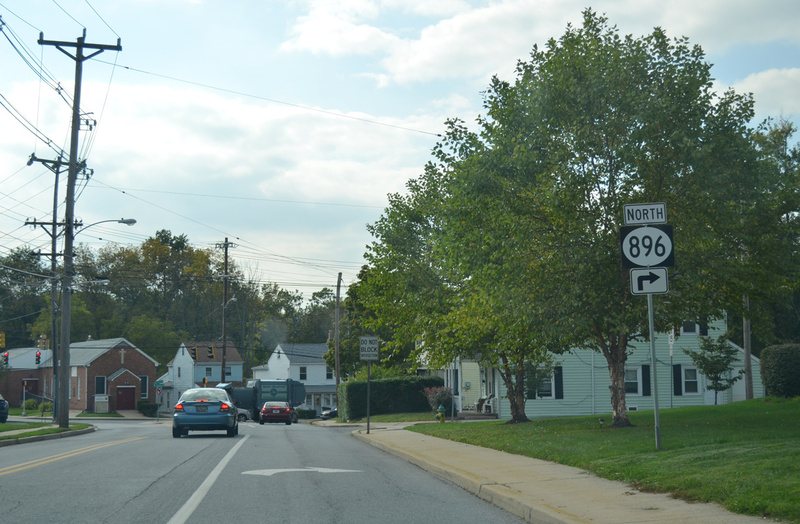 SR 896 north overlaps with SR 273 west on the block of West Main Street between South College Avenue and New London Road. A one-way couplet carries Delaware 273 through Downtown Newark. 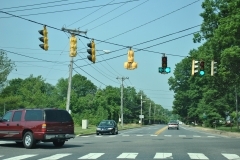 Eastbound splits from westbound at the junction of West Main Street, New London Road, and South Main Street (formerly Elkton Road). 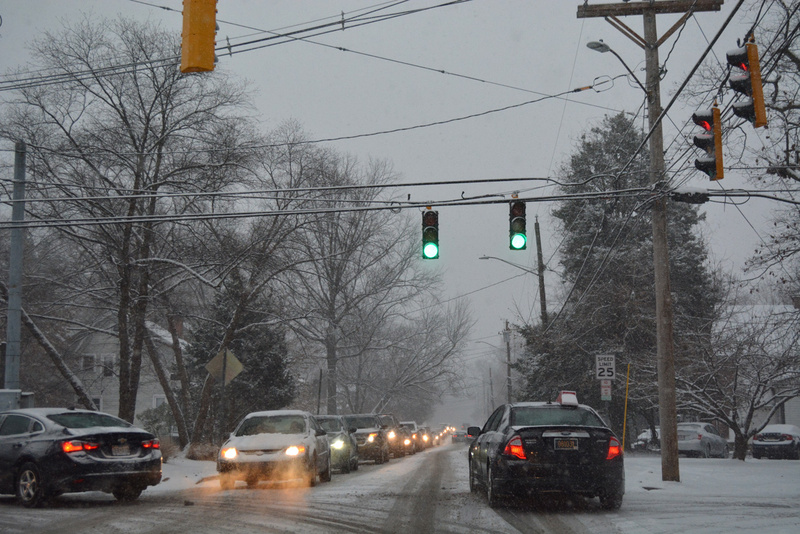 There eastbound turns southwest briefly on South Main Street before resuming an easterly course on Delaware Avenue. Westbound Delaware 273 follows all of Main Street through the business district. 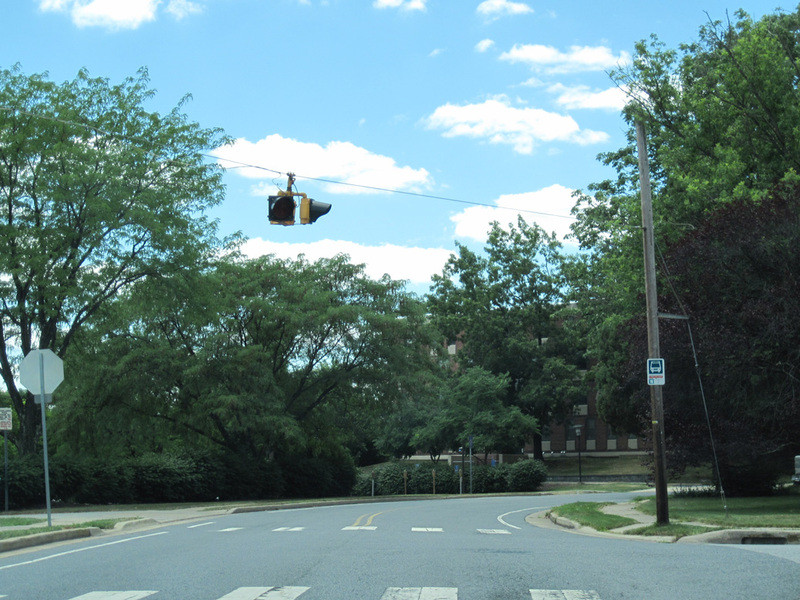 Delaware Avenue flows east to end at SR 72 (Library Avenue) opposite the entrance to College Square Shopping Center. 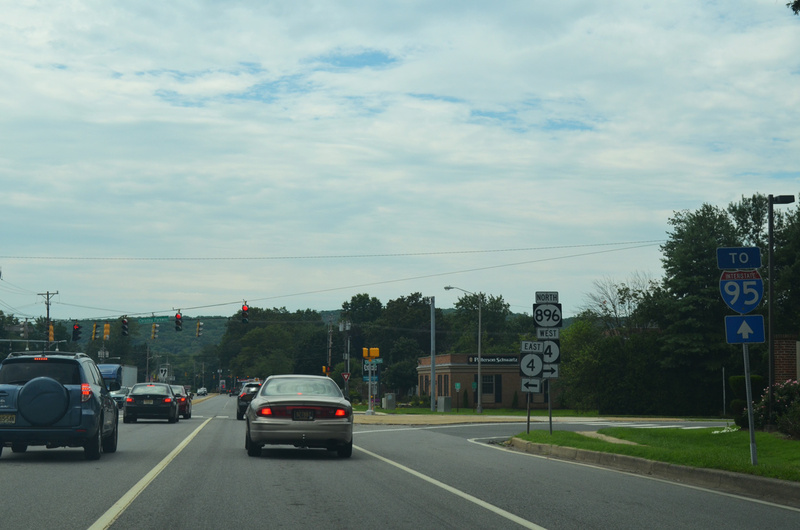 There SR 273 turns north onto SR 72 for two tenths of a mile to rejoin westbound along Ogletown. Delaware 273 exits Newark along a four-lane divided arterial en route to Christiana. 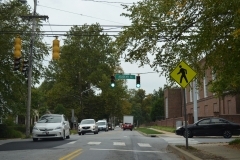 This stretch was expanded from two lanes between 1996 and 1998 to coincide with a new alignment through Ogletown. 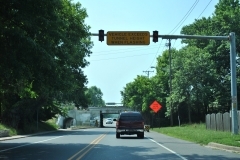 The new expressway segment bypassed the Avon underpass below AMTRAK and includes a partial interchange and grade separation at Delaware 4 (Ogletown Stanton Road). 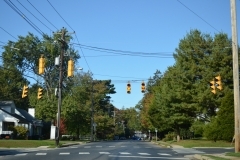 There were signs posted along the one block area of Hillside Road (Delaware 896 south) between West Main Street (Delaware 273) and New London Road (Delaware 896 north) during the 1990s. 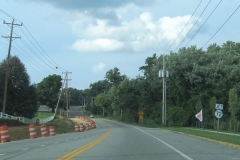 The path of the truck route was uncertain and signs were removed by 2000. State Route 279 was designated in fall 2013 over the westernmost 1.05 miles of Elkton Road over former SR 2. 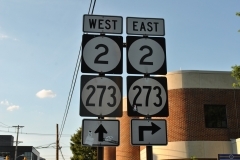 SR 279 begins at Elkton Road (SR 896) and Christina Parkway (SR 4), replacing SR 2 southwest to become Maryland 279 ahead of Interstate 95 and Elkton. 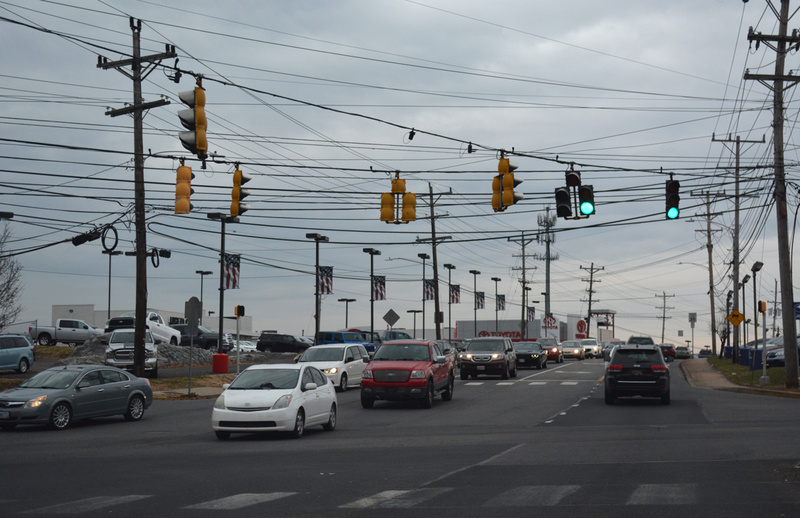 A number of industrial businesses front Elkton Road to the state line. 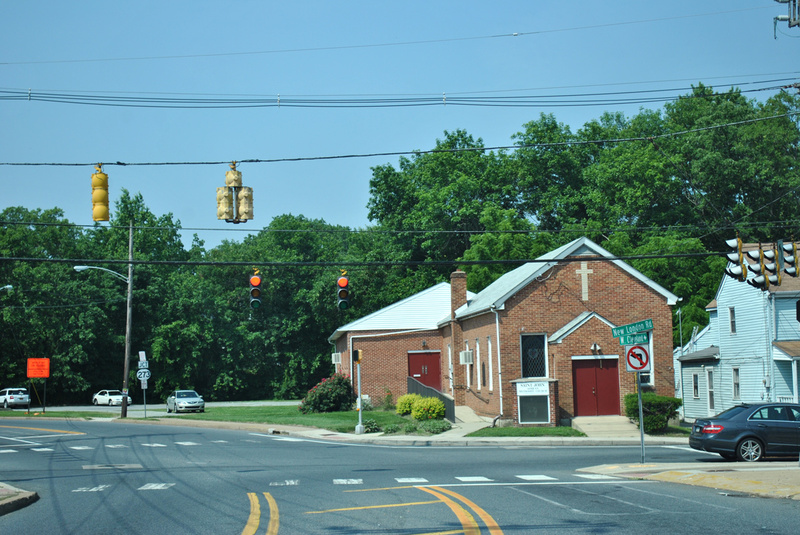 Otts Chapel Road also ties in from the Glasgow area and U.S. 40 (via Pleasant Valley Road). 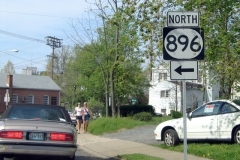 An import from Pennsylvania, Delaware 896 (New London Road) actually enters the state from a short unsigned portion of Maryland 896 at the Northeastern corner of that state. 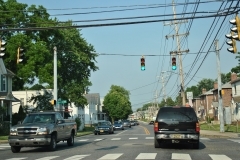 The two-lane highway links the city of Newark with rural Chester County, Pennsylvania and the U.S. 30 corridor at Lancaster. Upon entering the Diamond State, Delaware 896 encounters beautiful White Clay Creek State Park. 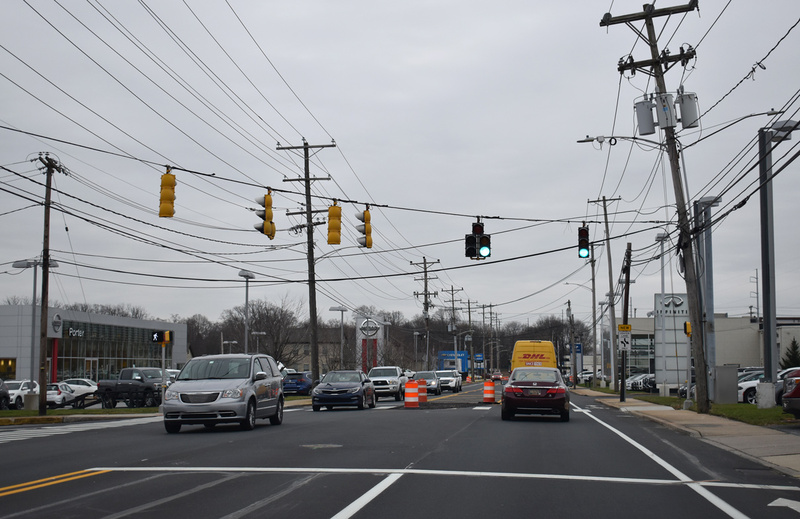 The two-lane highway features full shoulders and a 50 mile per hour speed limit north of the Newark city line and a 35 mile per hour speed lime south of Scotch Pine Road through Newark. 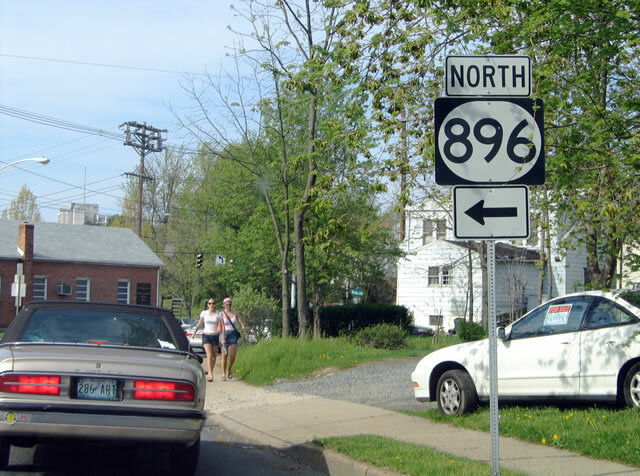 The alignment of SR 896 used to be cut and dry through central Newark. 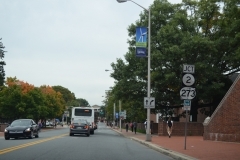 The state route originally followed South College Avenue southward from Delaware Avenue (SR 273 east) and West Main Street (SR 273 west) through the University of Delaware campus to south Newark. 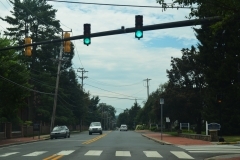 Main Street and New London Road were striped for two-way traffic at that time and Delaware 896 followed them exclusively with no separation of its north and southbound components. 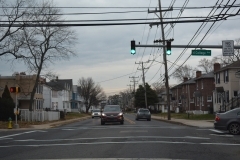 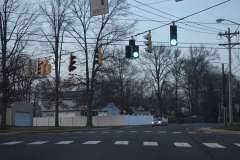 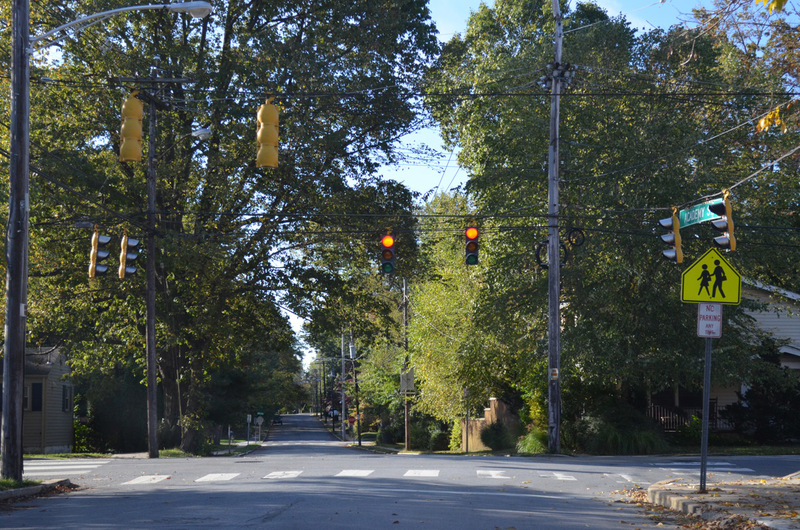 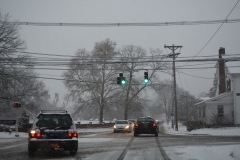 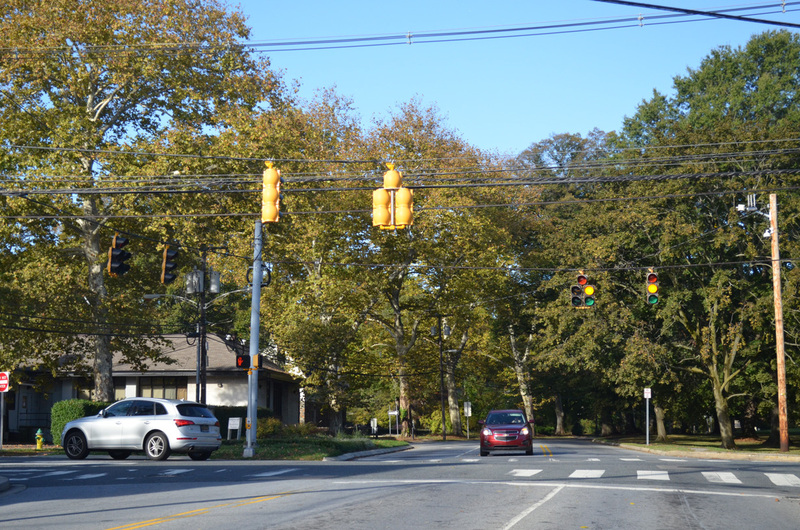 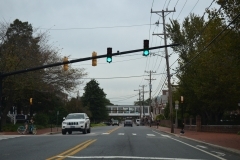 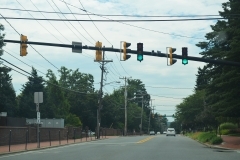 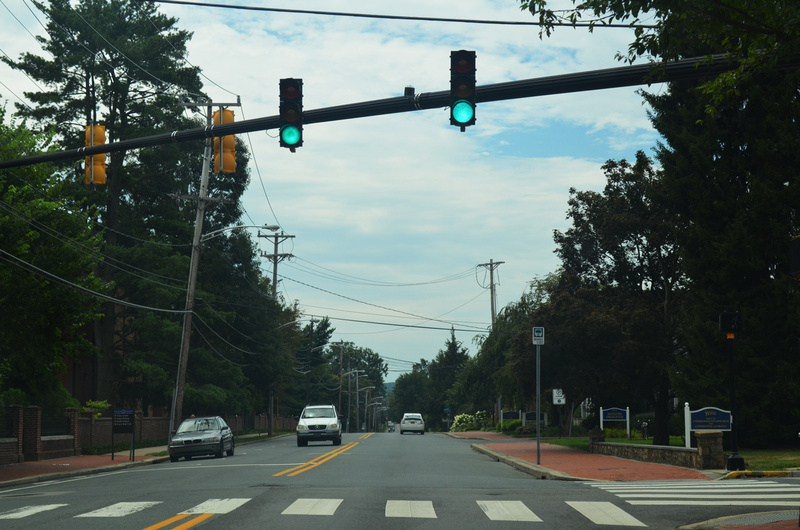 Changes came to the alignment when the city of Newark restriped Delaware Avenue, Main Street, and the southernmost block of New London Road into one way streets. 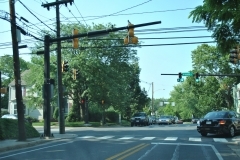 Additional changes to Delaware 896 occurred in the 1980s. 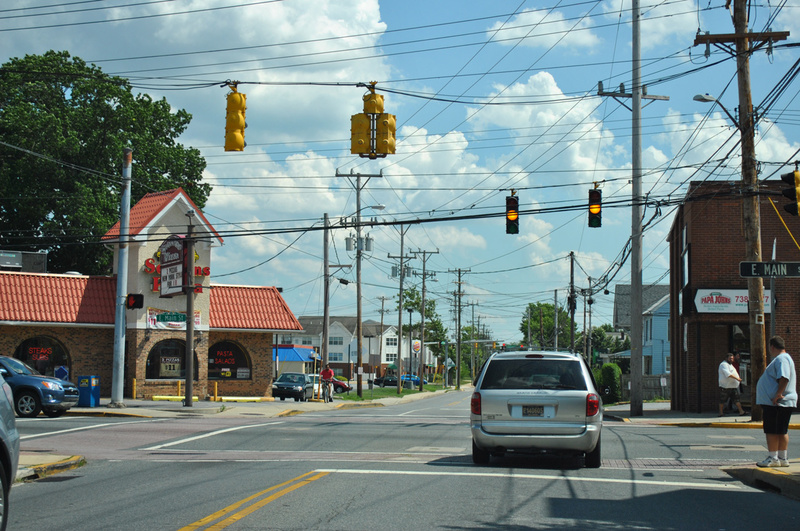 In an effort to move traffic away from the University of Delaware campus and Downtown in general, Delaware 896 was relocated to an overlap with Delaware 2 along Elkton Road and Delaware 4 along Christina Parkway to bypass central Newark. 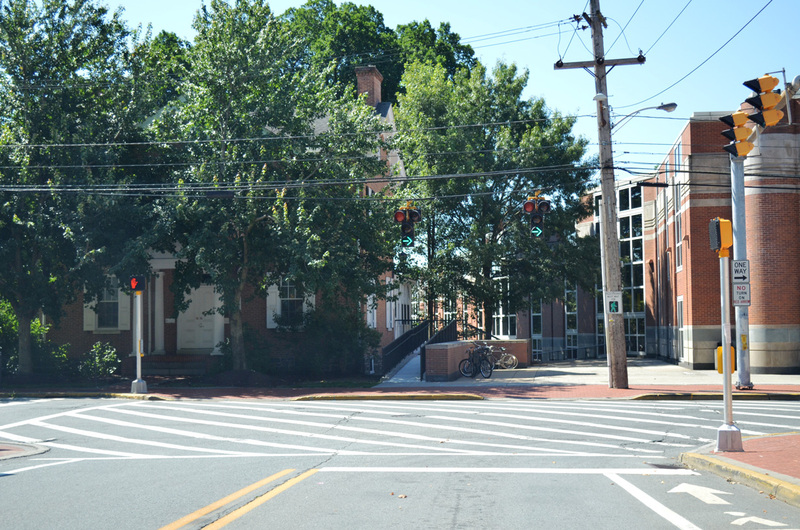 Reasoning for the relocation involved the many crosswalks and pedestrians traveling across the University of Delaware campus between Park Place and West Main Street. 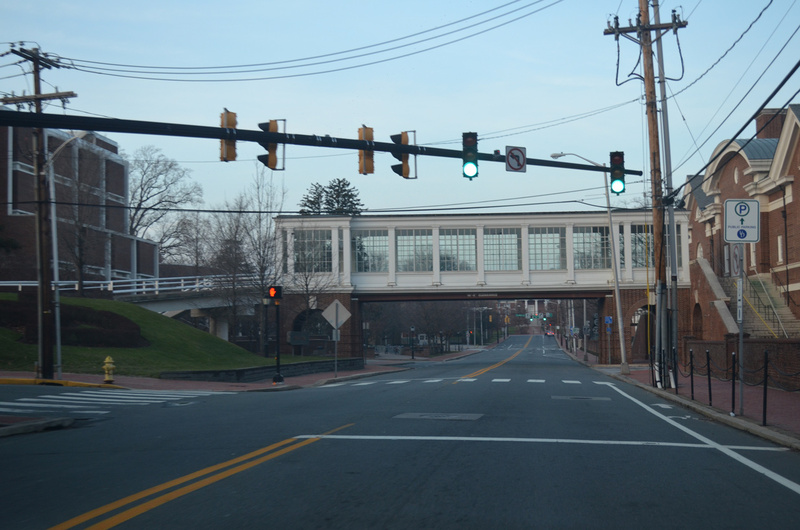 Also of interest along South College Avenue is the 1960s railroad crossing over the AMTRAK Northeast corridor. 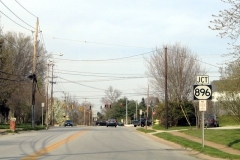 A short one-block spur to Holton Place remains west of the overpass as a former alignment of Delaware 896. 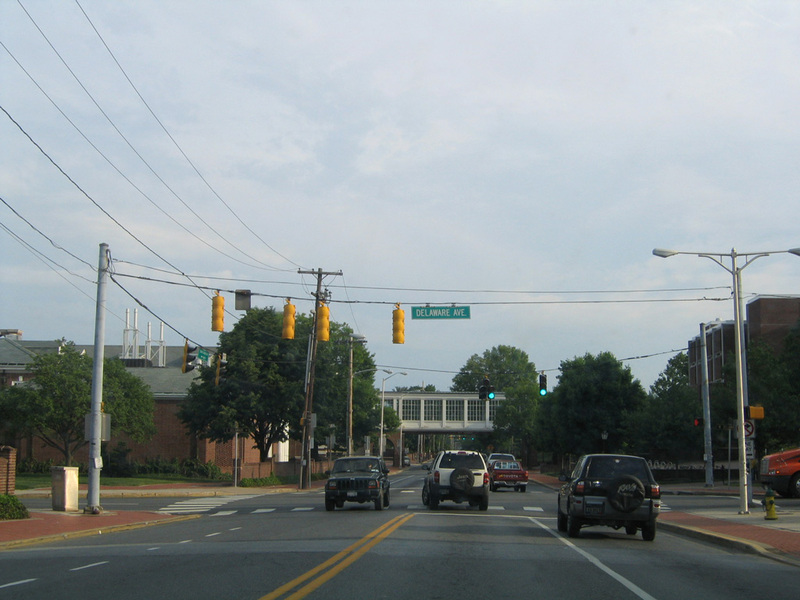 South College Avenue transitions into a four-lane arterial beyond the AMTRAK under crossing by the University of Delaware athletic facilities, including the football stadium and Bob Carpenter Center (basketball arena / concert venue), to Interstate 95. 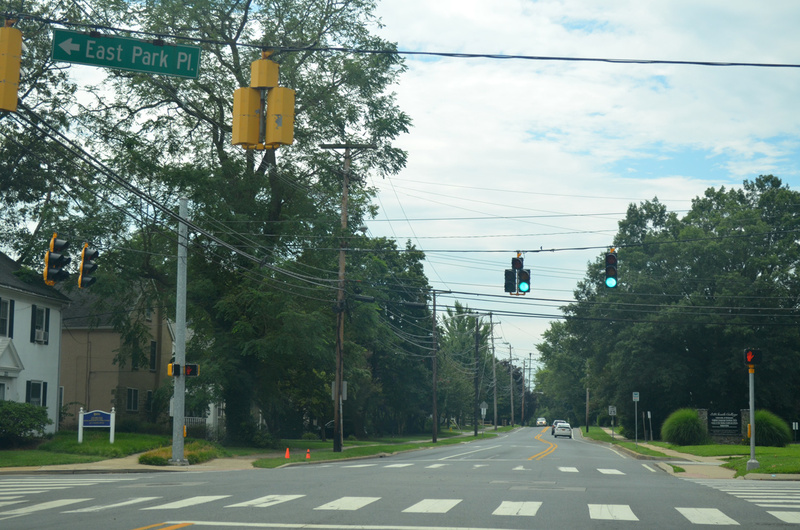 Delaware 896 rejoins South College Avenue from Christina Parkway (Delaware 4), 1.7 miles south of Downtown. 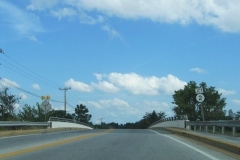 The state route proceeds another half mile to a parclo interchange with Interstate 95 and an exit of the city. 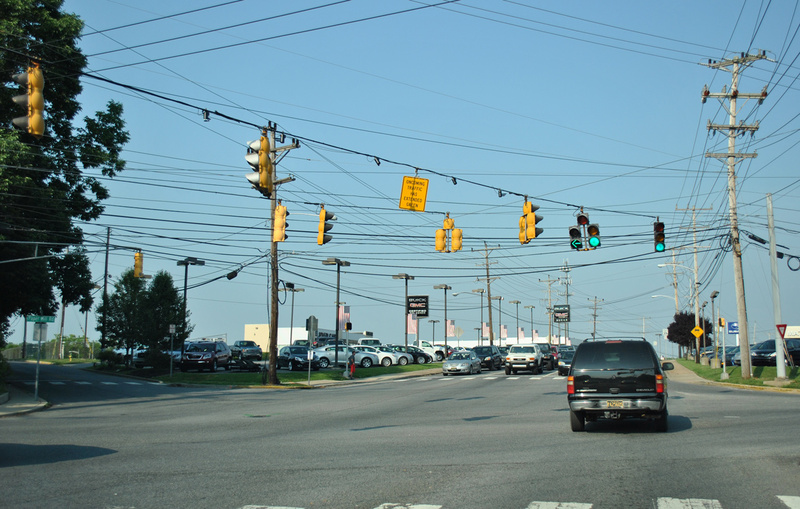 The Newark beltway consisted of a proposed network of roads encircling the city from the west, south, and east between the Maryland state line and Delaware 7 (Limestone Road). 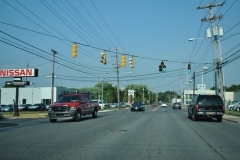 Around 1970 a study was undertaken by the state of Delaware to construct a multi lane highway around the growing city of Newark. 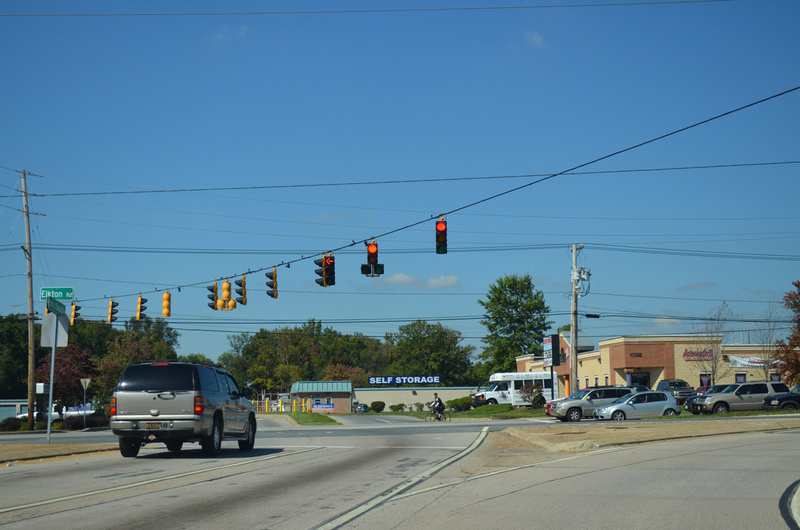 The intention of this highway was to provide adequate transportation infrastructure for the expanding city. 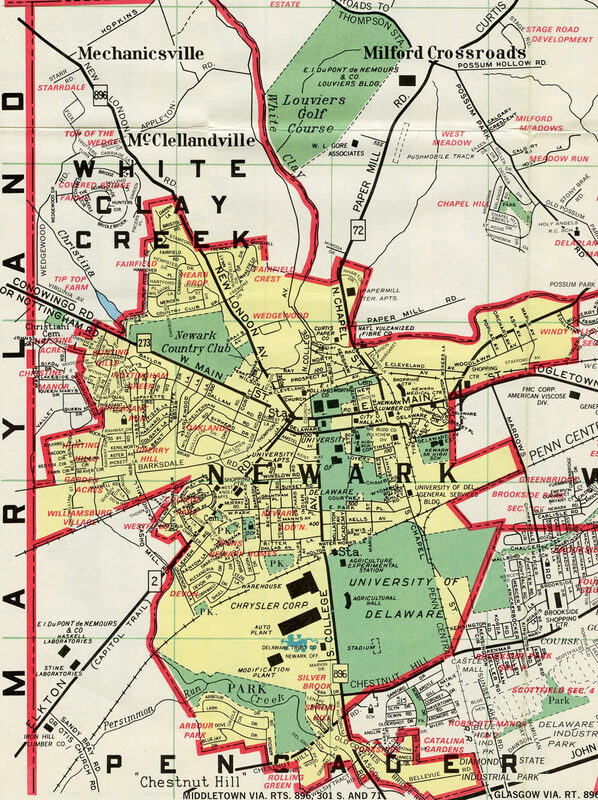 As envisioned, the beltway would have followed existing Delaware 4, a new alignment along the state line (roughly parallel to Casho Mill Road), a new alignment through what is now White Clay Creek State Park, portions of current Linden Hill Road and Delaware 72 (Possum Park Road), and a portion along the defunct Pike Creek Freeway. 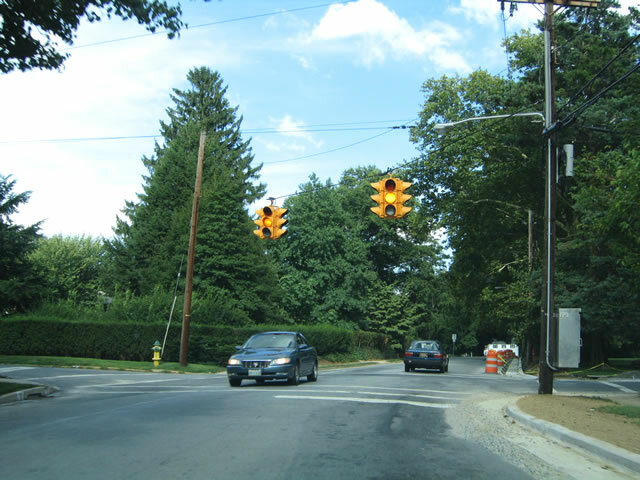 The aforementioned Delaware 4 (Christina Parkway and Chestnut Hill Road) encompasses the southern segment of the beltway. 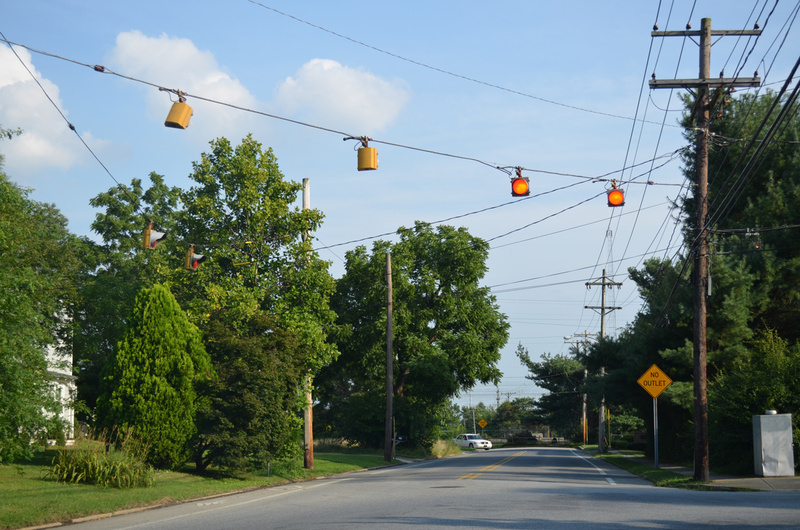 East from Elkton Road (Delaware 279) to Delaware 72 (South Chapel Street), Delaware 4 exists almost entirely as a four-lane divided facility with at-grade intersections. 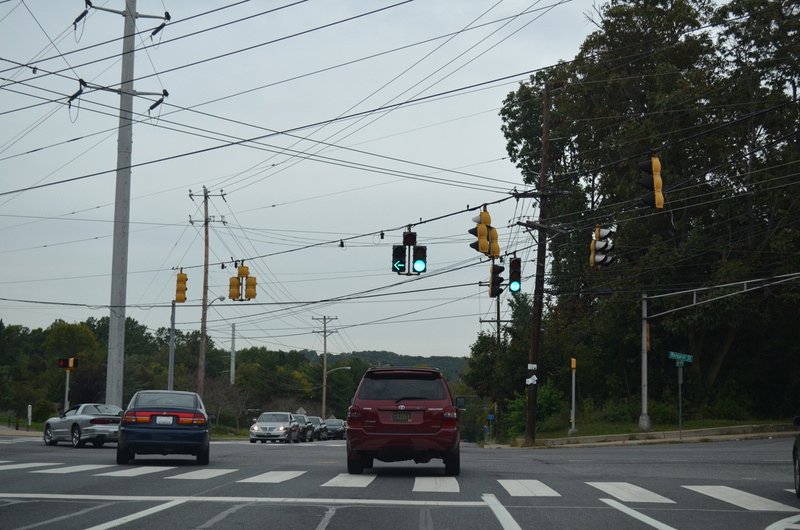 This was not the original plan as interchanges were slated for Delaware 4 at key intersections. 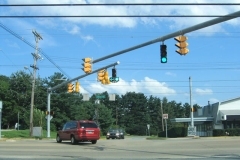 Of the interchanges planned, a standard diamond was considered at Robscott Manor (Argyle Road) and the adjacent University of Delaware athletic facilities. 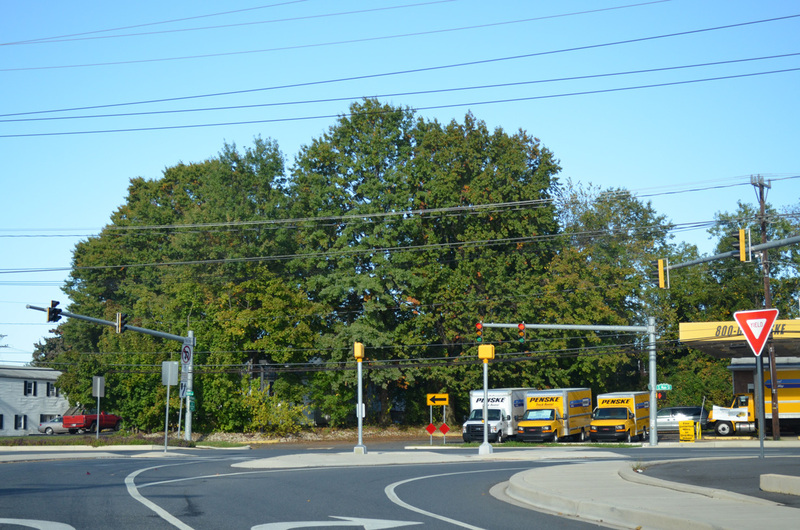 Unfortunately for planners the interchange drew heavy criticism that ultimately led to its cancellation and subsequent downgrading of Delaware 4 from controlled access standards to an at-grade facility. 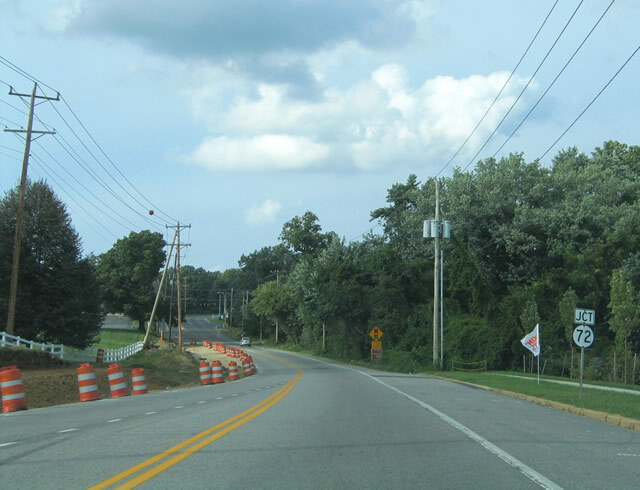 The beltway section from old Chestnut Hill Road to Elkton Road was constructed as Christiana Parkway. Built in 1985, the parkway carries four lanes overall with the exception of a two-lane bridge across the AMTRAK Northeast Corridor. 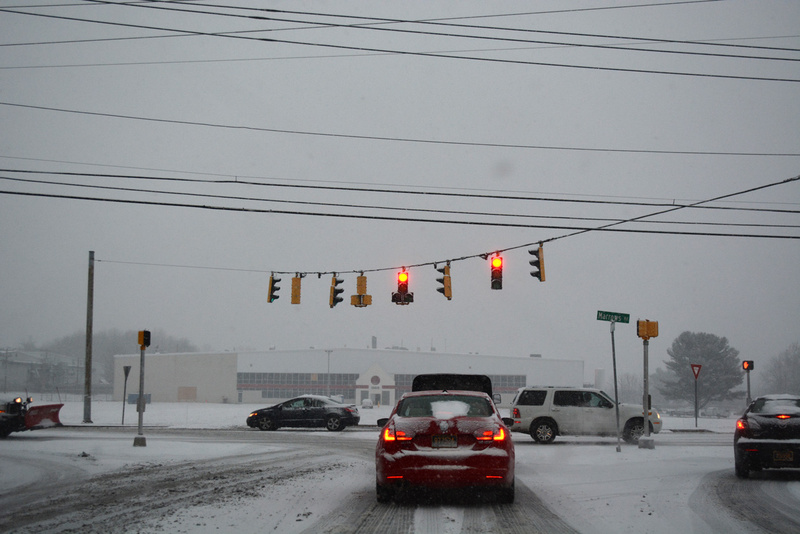 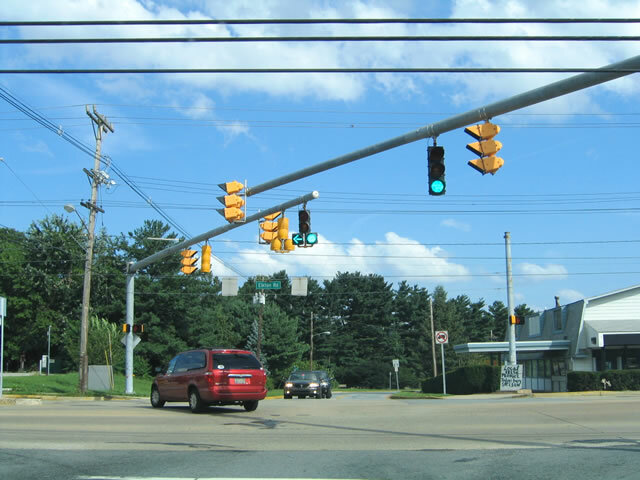 Two signalized intersections, the one east of AMTRAK added in 1998, served Chrysler’ Newark Assembly Plant. 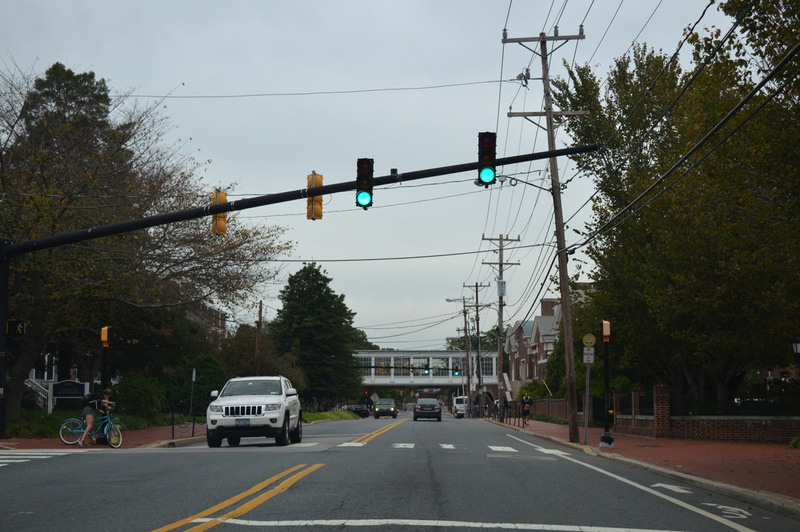 The automobile factory closed down in 2009, with redevelopment of the site undertaken by University of Delaware. 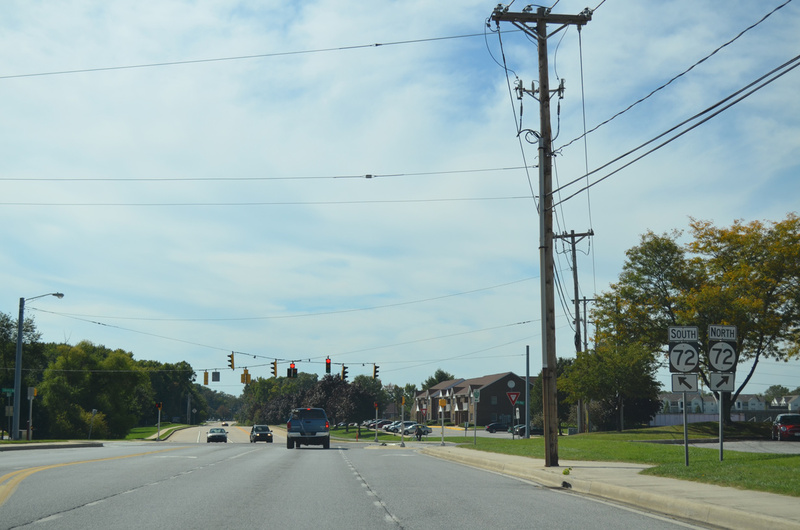 A late 1990s proposal arose to extend Christina Parkway northward from Elkton Road (SR 279) to Barksdale Road. 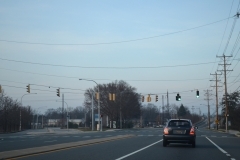 The extension was intended to open inaccessible land for development while providing a through route for Cecil County traffic traveling through Newark. 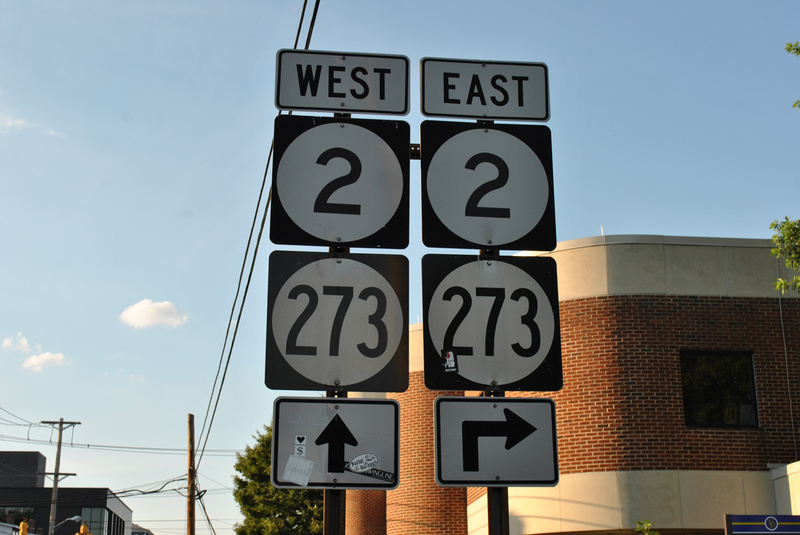 The original beltway alignment generally followed the arc of Christina Parkway northward along the state line to SR 273 (Nottingham Road). The extension was never constructed, though a small portion of Suburban Drive added follows the intended path to big box retail added at Suburban Plaza Shopping Center. 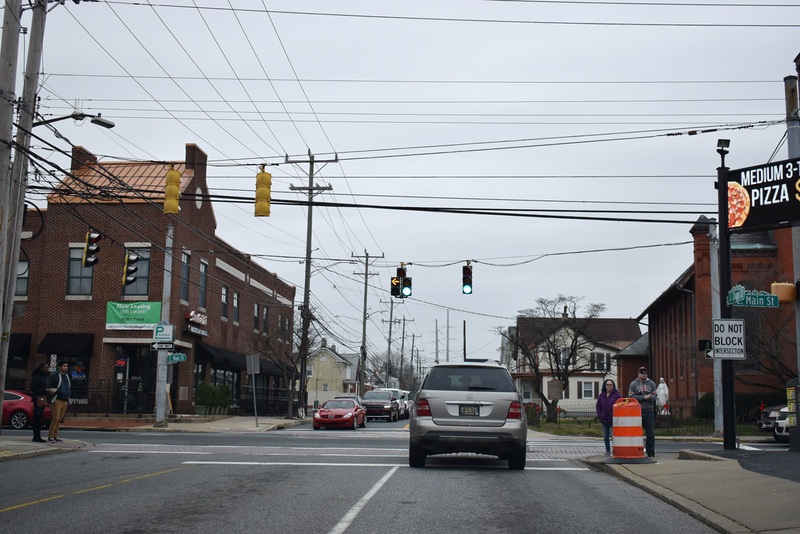 Other proposals on how to address Cecil County traffic through Newark led to a debate between city and county officials from both areas. 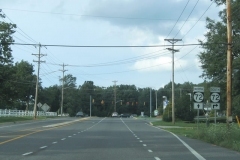 Newark political leaders advocated a new roadway on the Cecil County side of the state line, running north from Elkton Road to Maryland 273 (Nottingham Road). 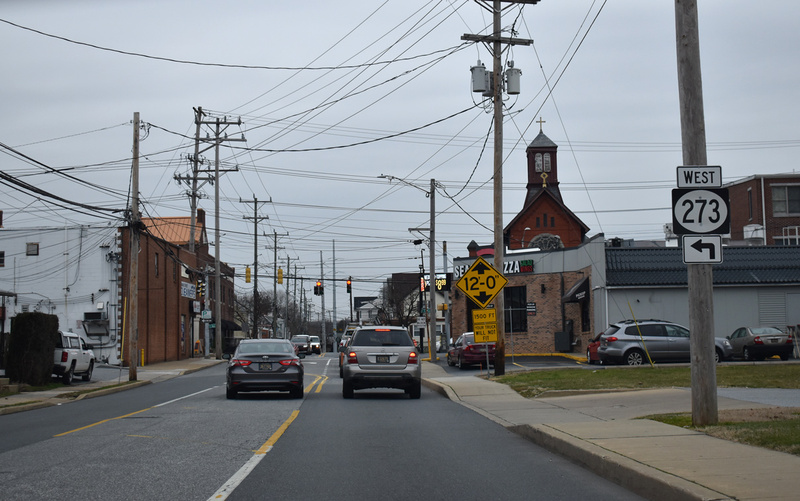 Cecil County leaders contended that a new road through the primarily rural stretch would be overrun with development, bringing unwelcome sprawl and congestion to the area. 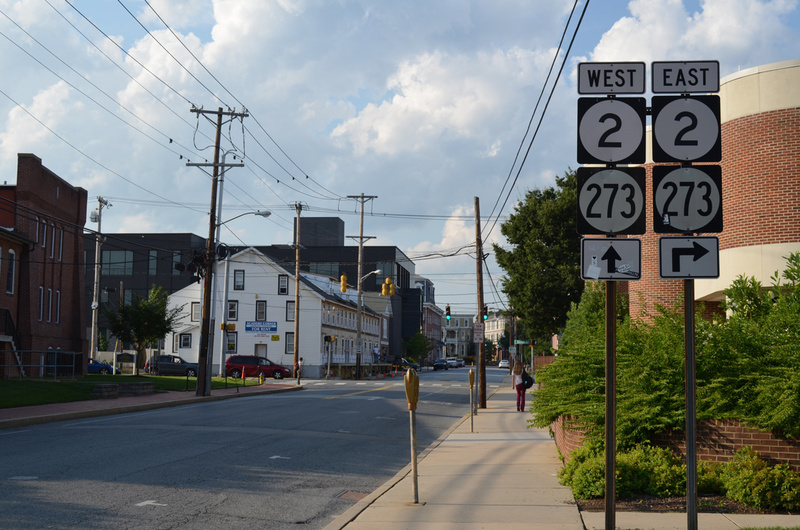 Newark officials countered that the roadway was essential for Maryland-based traffic that uses Delaware 273 through the city and that Maryland should accept more of the responsibility in solving the transportation problem. 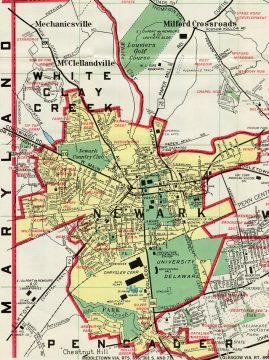 The northern part of the beltway exists only on paper. The proposed route followed a path near Wedgewood, Pleasant Hill, and Hopkins Roads, mostly through what is now White Clay Creek State Park. 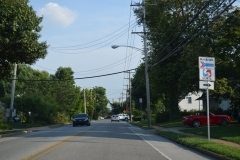 A path between Hopkins Road to New Linden Hill Road, possibly by way of Delaware 72 (Possum Park Road), would turn traffic southeast into the Pike Creek Valley. 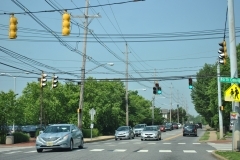 South from there, the beltway alignment was very uncertain as preliminary discussion halted before alternatives were drawn. The final element of the beltway plan utilized a portion of the proposed Pike Creek Freeway. 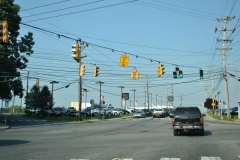 The limited access highway appeared on maps running south from Delaware 7 (Limestone Road), by way of Linden Hill Road, to Interstate 95 near the Delaware Turnpike Service Area. 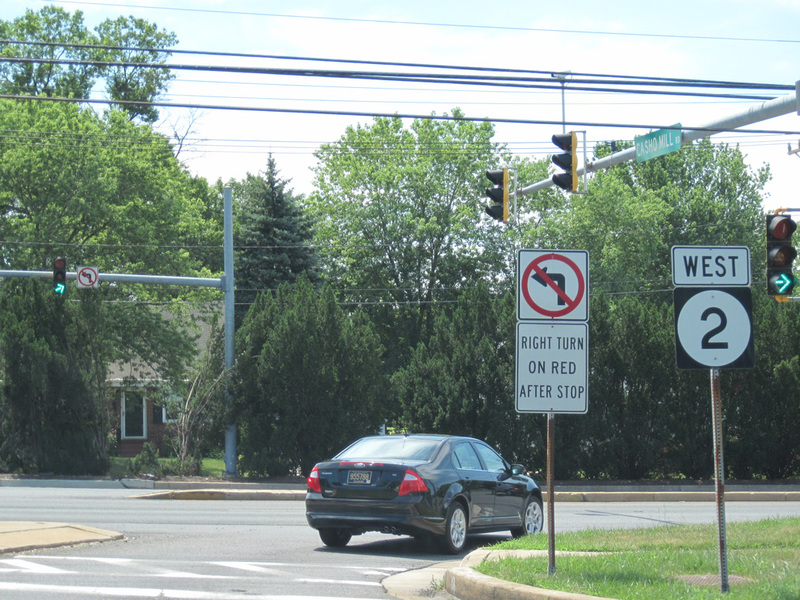 The nonexistent Exit 2 on the Delaware Turnpike was reserved for the Pike Creek Freeway. The Pike Creek Freeway was envisioned as an extension of the planned U.S. 301 freeway running south from the Delaware Turnpike to Middletown. 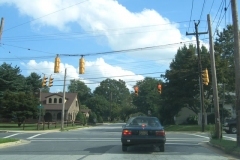 The alignment stemmed northeastward from Interstate 95 across Delaware 4 and 273 to the intersection of Delaware 2 (Capitol Trail) with Harmony Road. There an interchange would facilitate movements between the freeway and Capitol Trail. 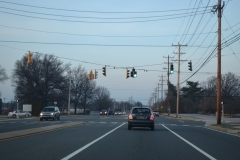 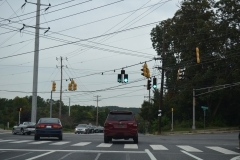 A multi lane at-grade highway would continue northward along the path of Upper Pike Creek Road to Linden Hill Road, tieing into the northern segment of the beltway. 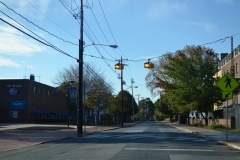 Academy Street runs through the heart of the University of Delaware campus between East Park Place and Main Street (Delaware 273 west). 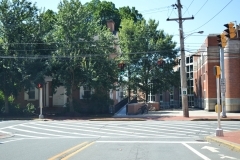 The two-lane street serves many of the university facilities including the student center and several halls. 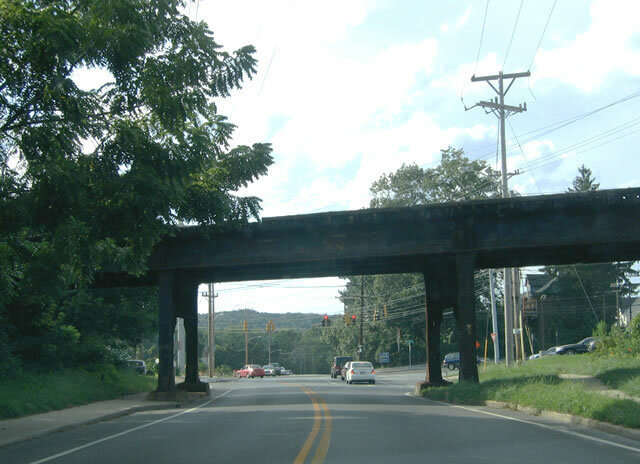 Apple Road links Barksdale Road west and Hillside Road east with South Main Street (SR 896) across a 1970-built bridge spanning the CSX Railroad. 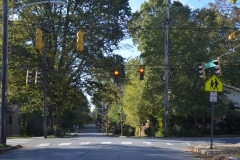 South of West Park Place to Dallas Avenue, Apple Road transitions from a major collector to a residential street. 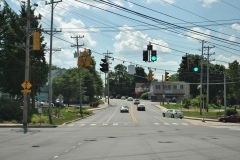 Apple Road was expanded to include a right turn lane to South Main Street (SR 896) as part of the Elkton Road reconstruction project completed in 2012. 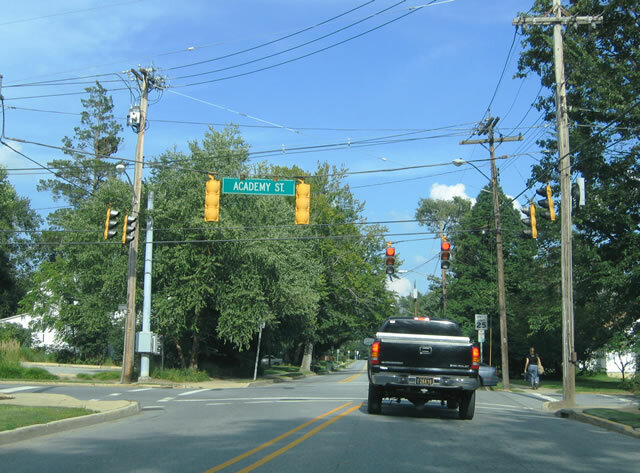 Barksdale Road extends Appleton Road east from Maryland into the city of Newark. 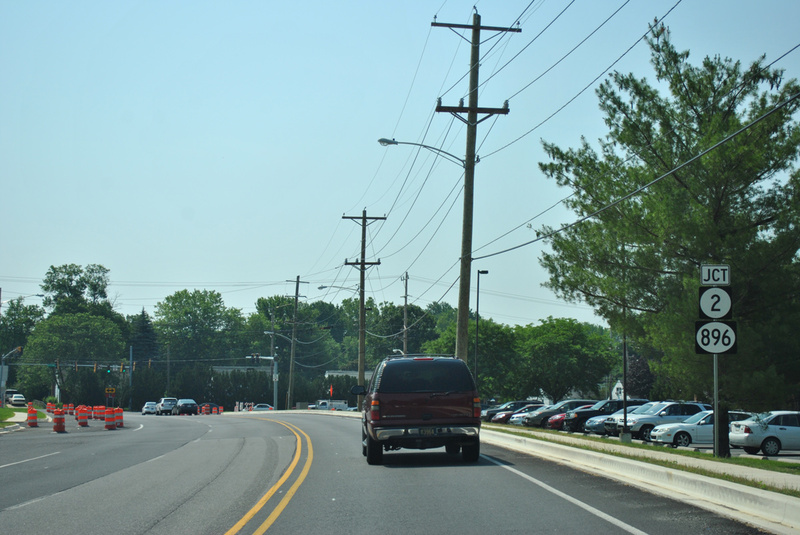 The roadway transitions from a narrow two-lane roadway in Cecil County to a suburban roadway with shoulders and bike lanes beyond the Delaware state line. 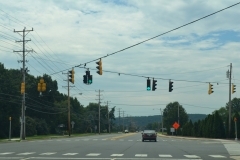 East of Apple Road, Barksdale Road becomes Hillside Road en route to SR 273 (West Main Street), SR 896 (New London Road) and Cleveland Avenue. Extending Hillside Road east, Cleveland Avenue provides a popular short-cut between SR 2, SR 72 (Capitol Trail), SR 273 (West Main Street) and Hillside / Barksdale Roads for Maryland-bound motorists. The campus of the University of Delaware extends northward along North College Avenue to Ray Street. 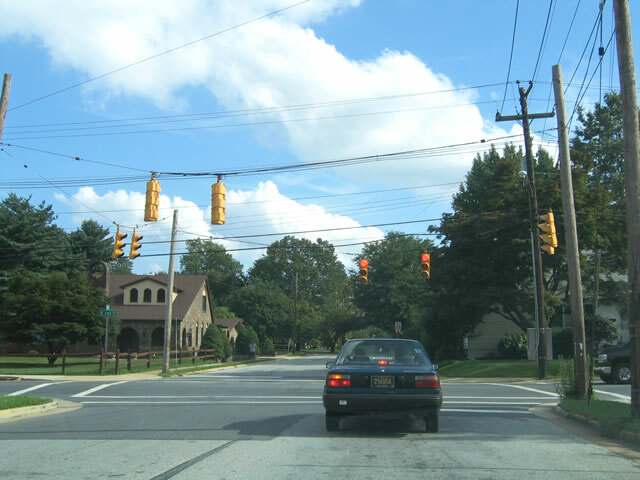 Within the middle of this area is the Cleveland Avenue intersection with the north-south street. The CSX Railroad parallels Cleveland Avenue and sometimes causes backups on College Avenue into this intersection. 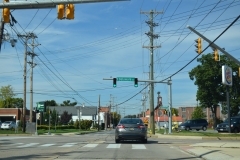 East from Chapel Street, Cleveland Avenue underwent a transformation from a road line with small businesses and residences to an auto mall during the 1980s and 1990s. 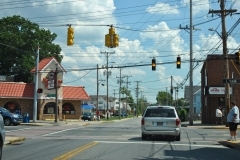 Among the former businesses along Cleveland Avenue were a pizza parlor, Chinese restaurant, and drive-in movie theater. 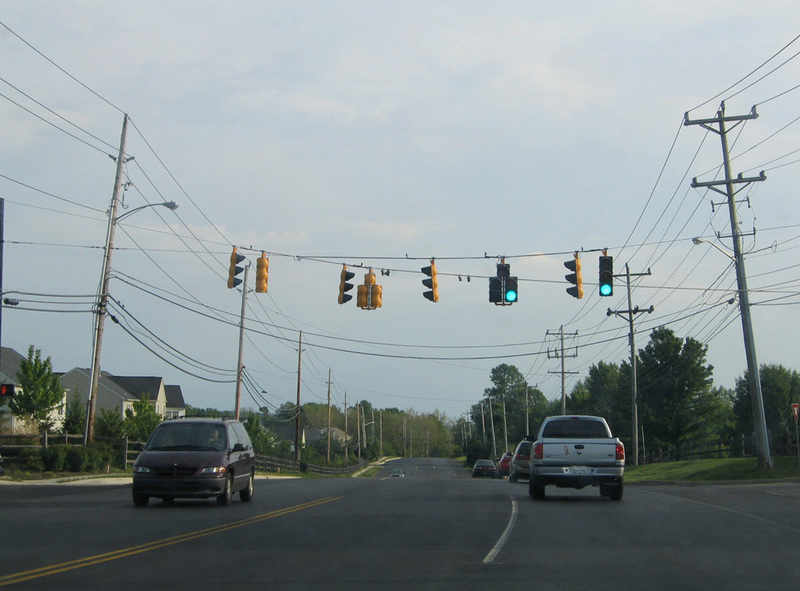 A traffic light was added along the four lane collector in the early 1990s at Winner Boulevard. 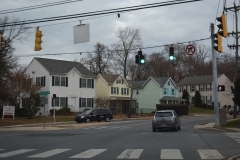 Casho Mill Road meanders northward from Delaware 896 (Elkton Road) to Delaware 273 (Nottingham Road) through older suburban neighborhoods of west Newark. 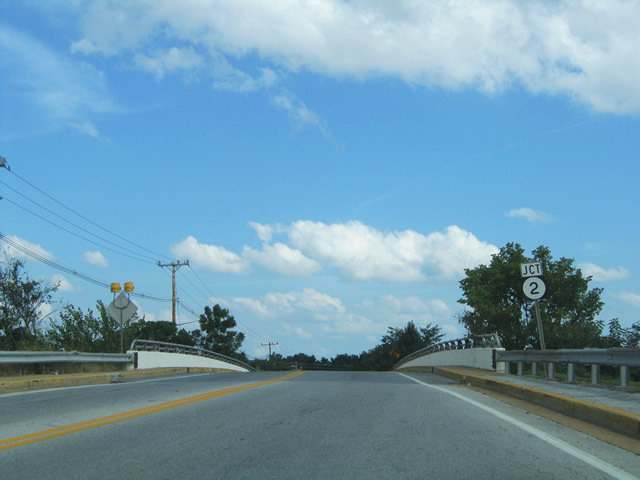 The road passes under a 20 foot long bridge supporting the CSX Railroad line midway between Elkton and Barksdale Roads. 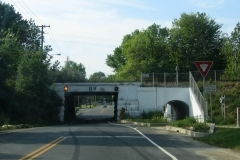 The narrow underpass was the site of controversy for years because it only accommodated one lane of traffic and pedestrian access was unsafe. In the 1990s, a concrete barrier and fluorescent light fixture were installed through the underpass, further narrowing the travel lane to accommodate a pedestrian walkway. 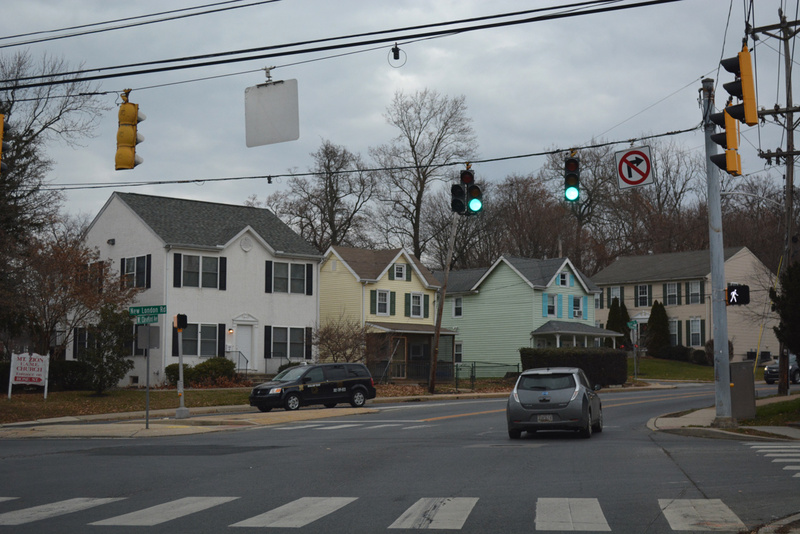 That process was not greeted openly and residents continued to demand a more permanent solution. 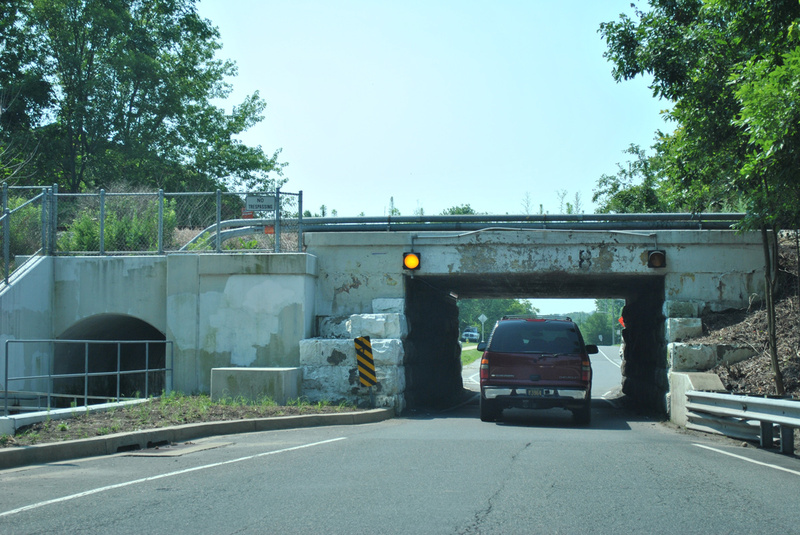 Due to the expensive cost, officials opted not to replace the underpass with a wider bridge due to potential disruptions to rail traffic on the busy CSX corridor. Instead, a precast tunnel was punched through adjacent to the roadway, separating vehicle and pedestrian traffic. 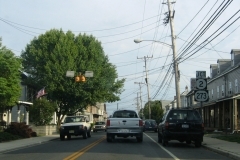 Chapel Street constitutes the original alignment of Delaware 72 through central Newark. 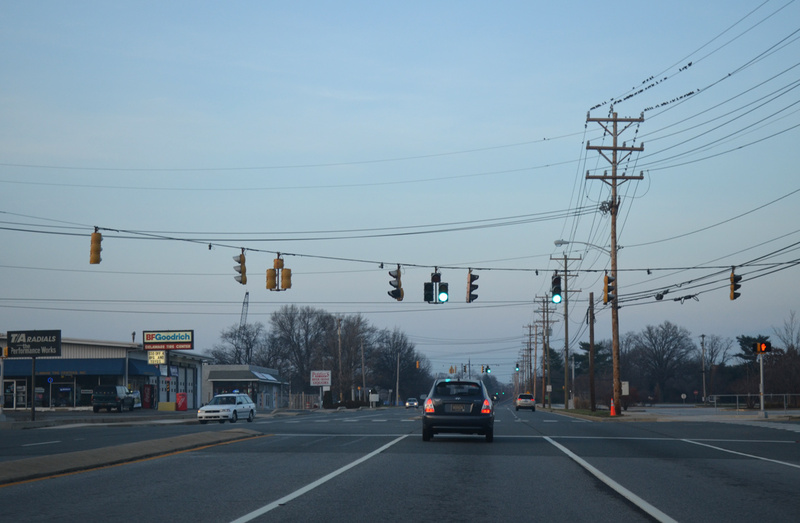 The north-south street continues Paper Mill Road southward from Cleveland Avenue to an end at the AMTRAK Northeast Corridor near East Park Place and Wyoming Road. 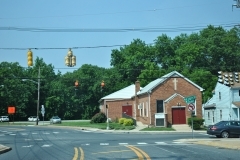 Chapel Street still represents a through route, despite its dead end at the AMTRAK Northeast Corridor three blocks south of Wyoming Avenue. 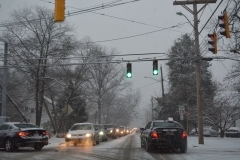 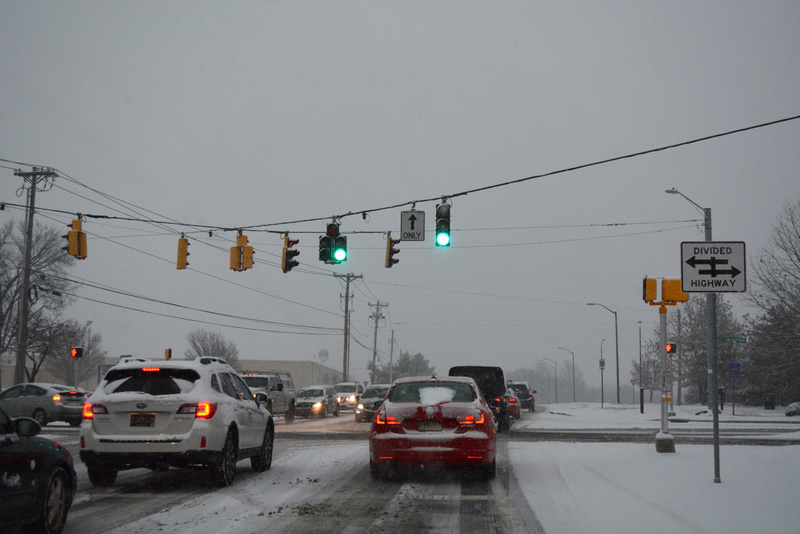 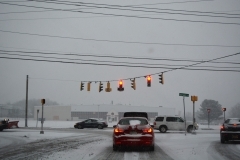 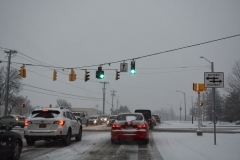 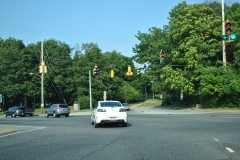 2017 traffic counts top out at 13,272 vehicles per day (vpd) between Delaware Avenue (Delaware 273 east) and the five-way intersection with Paper Mill Road, Cleveland Avenue and Margaret Street. 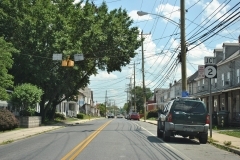 Much of the Main Street through Newark was redeveloped in the 1990s. 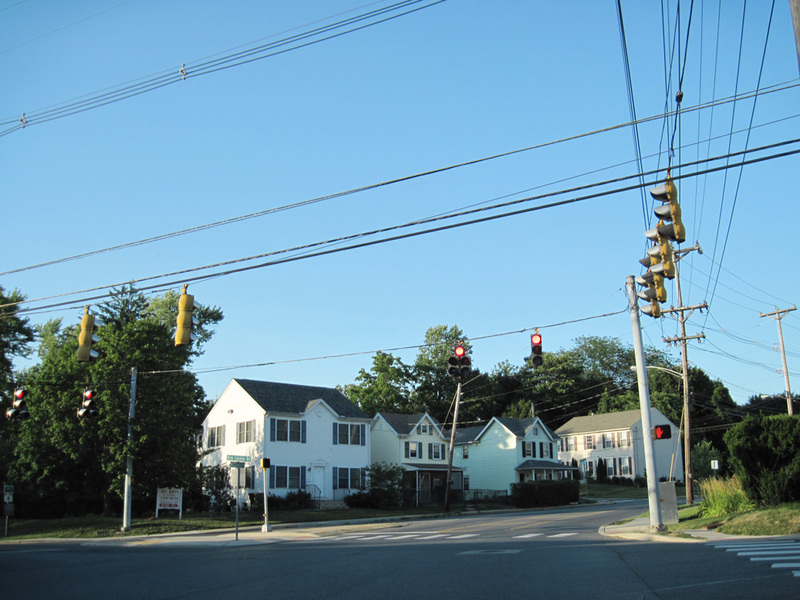 One such development is Astra Plaza, the 1997-built complex on the northwest corner of Chapel and Main Streets. 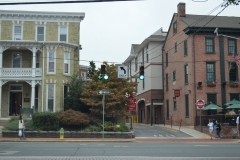 It houses both shops and eateries on the first floor and apartments on the second floor. 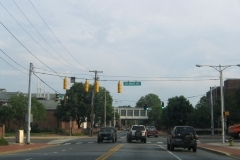 Further south, the former DelChapel Plant on Chapel Street was razed in 2000 to make away for a new apartment complex catering to University of Delaware students. Paper Mill Road, the former alignment of Delaware 72, rises over 200 feet in elevation from Newark to meet Delaware 72 (Possum Park Road) at Milford Crossroads. 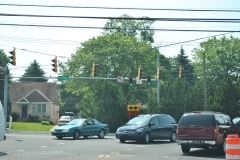 The stretch preceding Milford Crossroads and Thompson State Road passes by the Bank of America Deerfield site and several subdivisions built in the late 1990s. 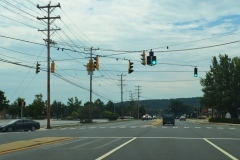 Two sets of signals were added due to the addition of these developments. 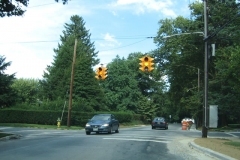 Chestnut Hill Road represents the former alignment of Delaware 4 between the Maryland state line and New Chestnut Hill Road near the Bob Carpenter Center. 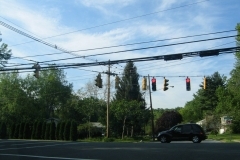 Iron Hill Road spurs northward from Chestnut Hill Road in adjacent Maryland, linking the road with Maryland 279 (Elkton Road). 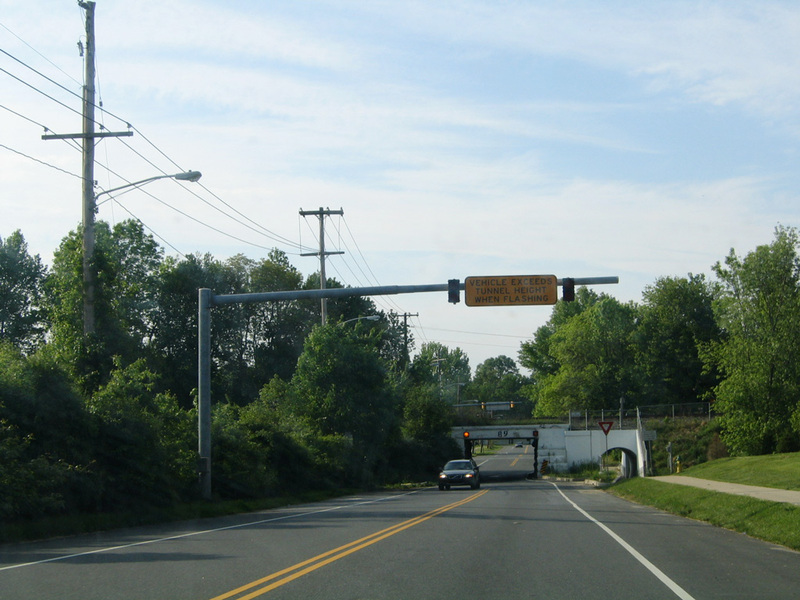 Prior to construction of Maryland’s Northeast Expressway (I-95), Chestnut Hill Road extended west to Maryland 279 (Elkton Road). 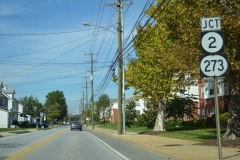 Just east of SR 896, Chestnut Hill Road becomes a part of Delaware 4 from the east end of Christina Parkway toward Ogletown. 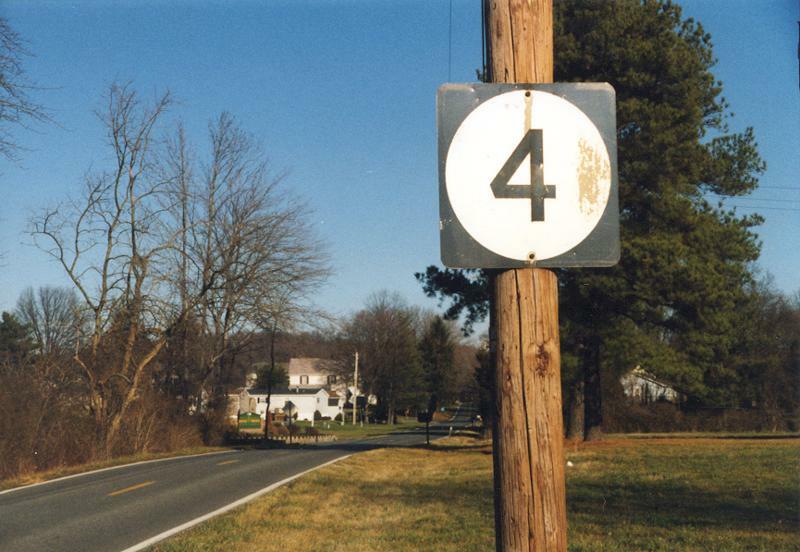 Removed sometime after 2000, this lone remaining Delaware 4 shield was posted along Chestnut Hill Road near the Maryland state line. 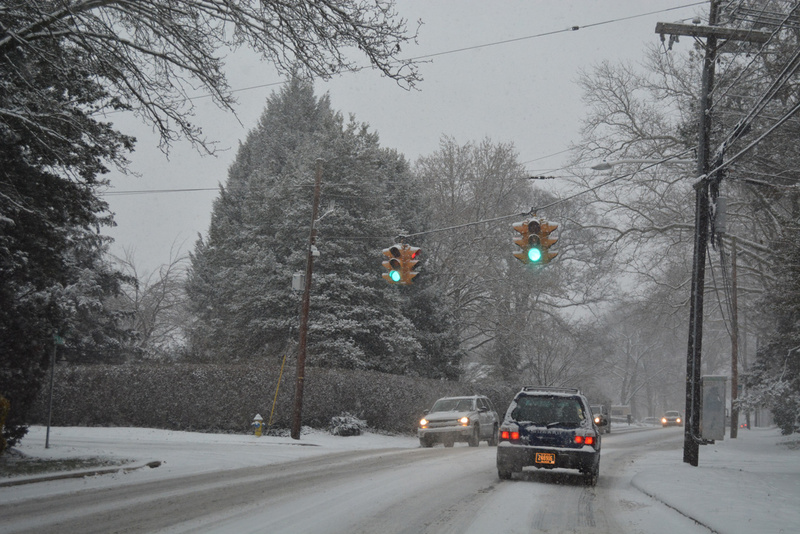 Photo taken 12/00. Approaching SR 896 (South College Avenue) on Chestnut Hill Road east. Photo taken 04/17/04. 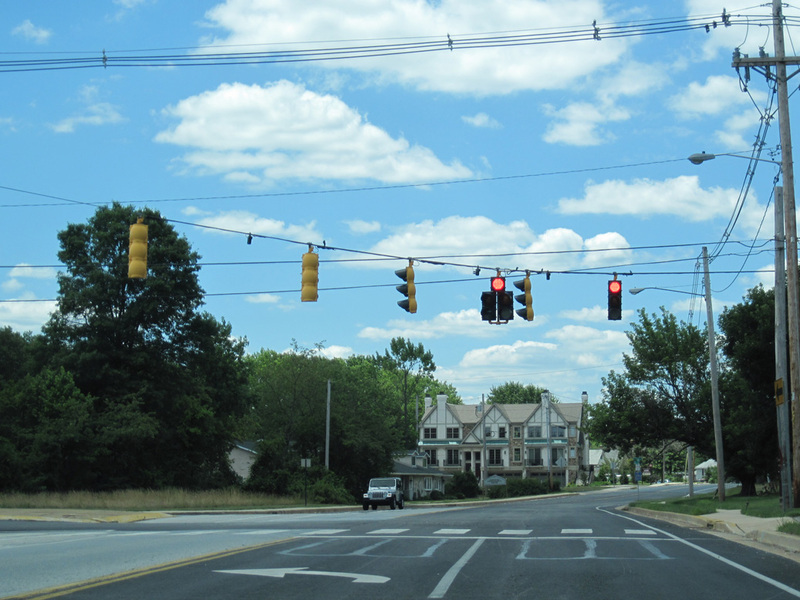 College Avenue used to carry Delaware 896 south from Delaware Avenue to Chestnut Hill Road. 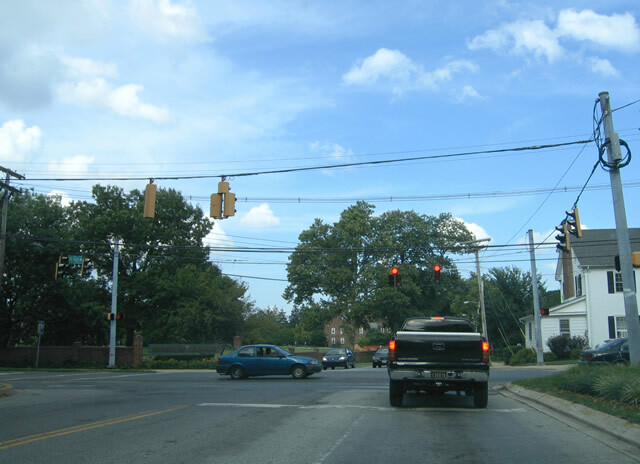 A 1980s realignment shifted the route onto Christina Parkway and Elkton Road to bypass the U of D Campus between here and Park Place. 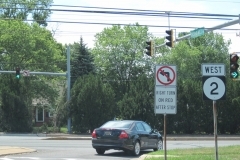 Otts Chapel Road ends at Elkton Road amid several industrial parks on the west side of Newark. 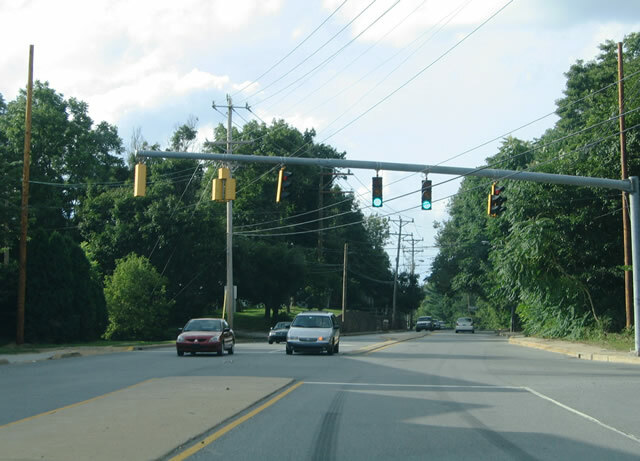 The four-lane arterial leads south to Chestnut Hill Road, where it narrows to two lanes en route to Old Baltimore Pike and Pleasant Valley Road south to Glasgow. Otts Chapel Road north at Chestnut Hill Road. 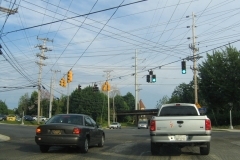 Photo taken 05/15/05. 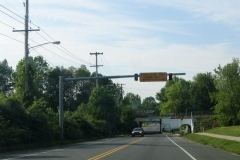 Otts Chapel Road lowers from a bridge over AMTRAK's Northeast Corridor to an unmarked intersection with SR 279 (Elkton Road). 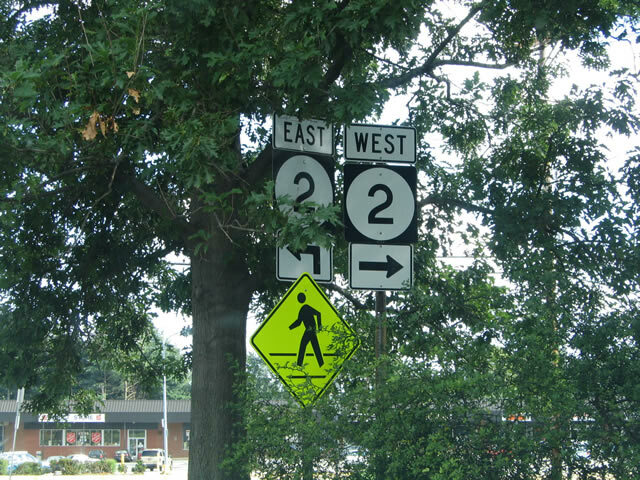 Prior to 2014, signs were posted on the approach for SR 2. 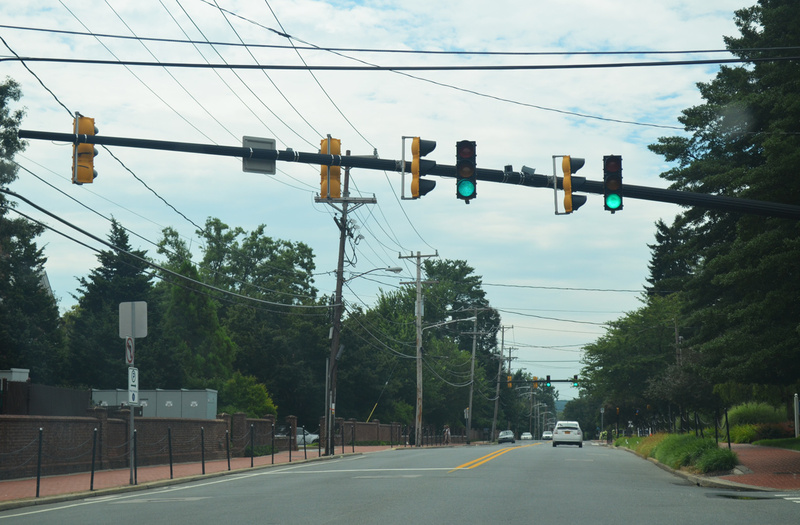 Photo taken 09/26/14. 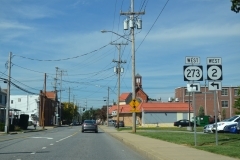 SR 279 (Elkton Road) forms a multi state route with Maryland 279 southwest from SR 4/896 to Elkton. 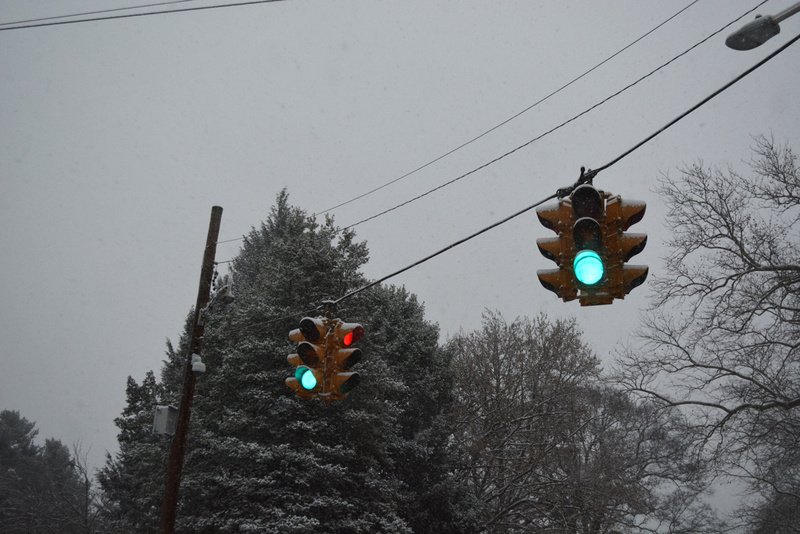 Photo taken 09/26/14. 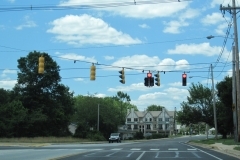 Park Place provides a secondary east-west through route across the city of Newark. 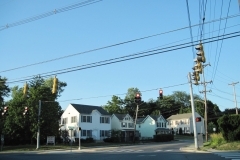 Although not signed as such, and definitely not encouraged as one by locals, the residential street provides a viable cross town alternate to the congested Main Street and Delaware Avenue. Park Place is signed as West Park Place west of College Avenue and East Park Place east of College Avenue. 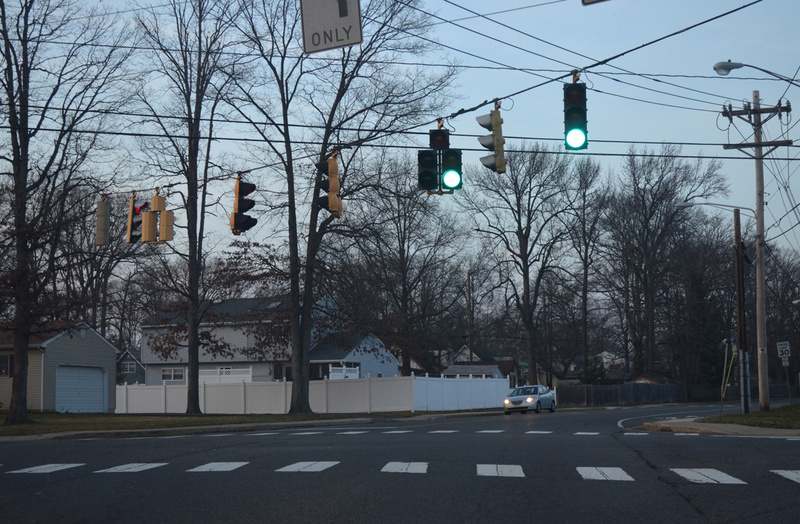 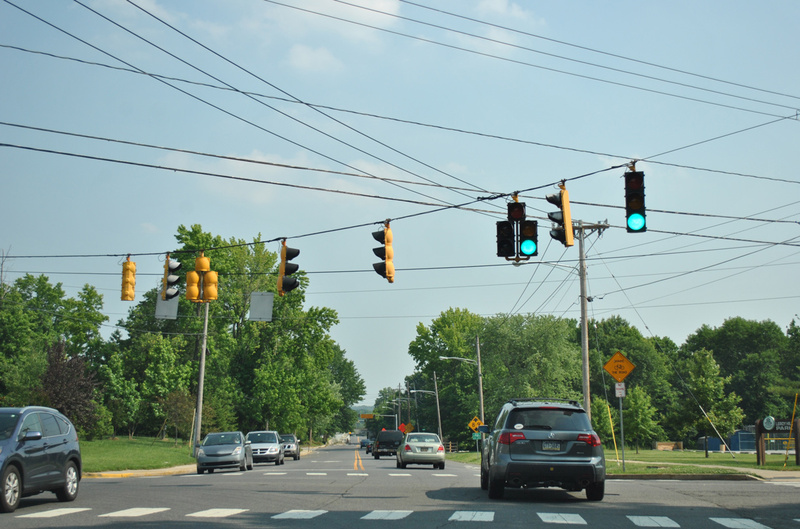 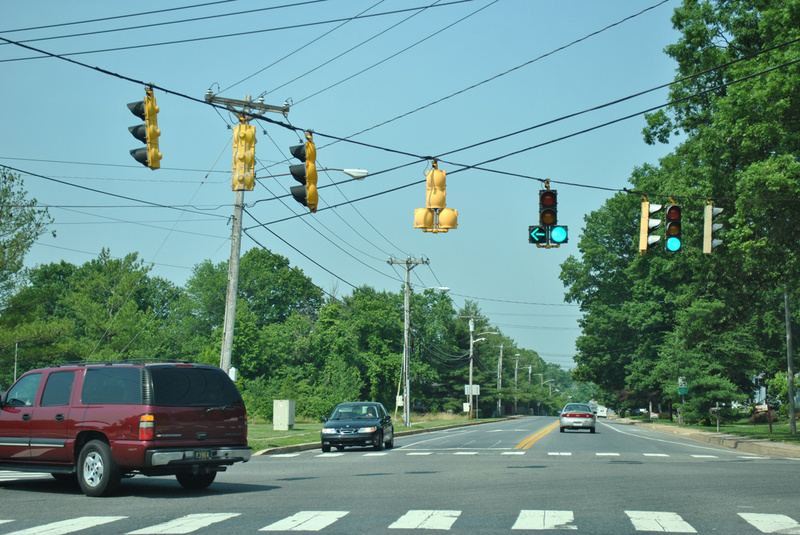 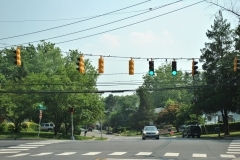 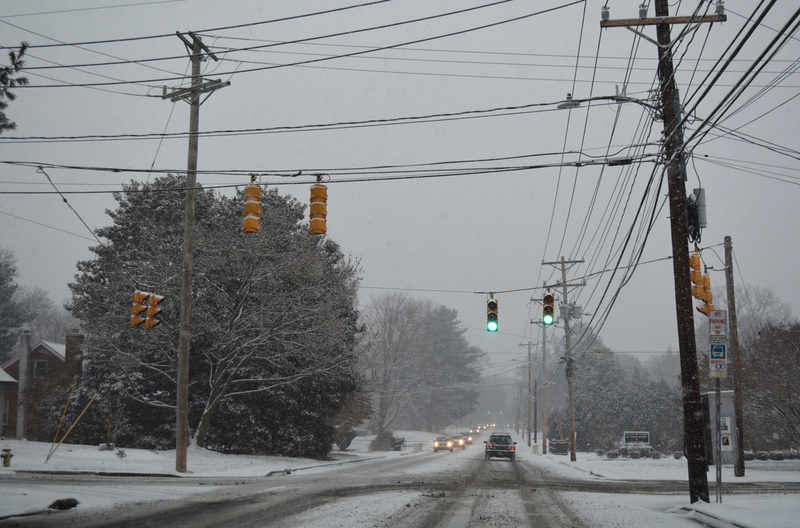 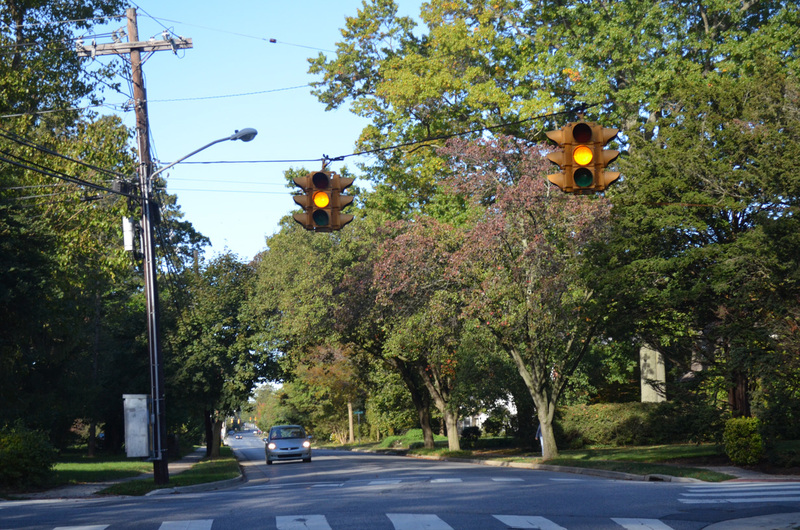 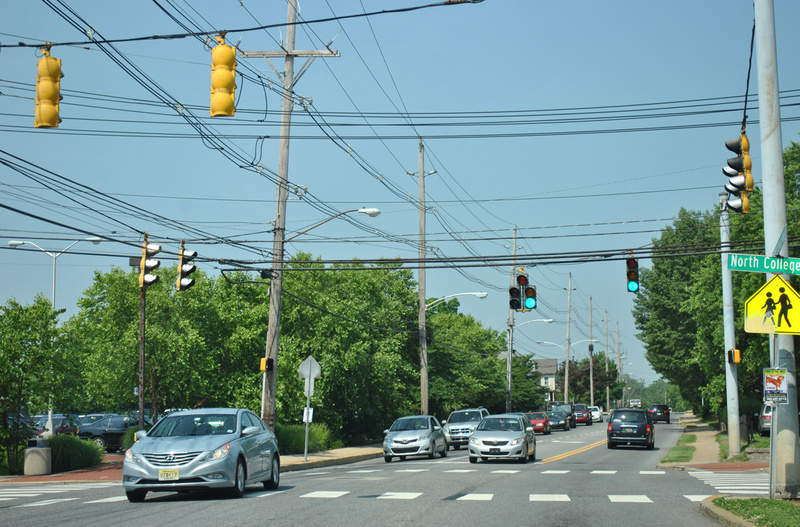 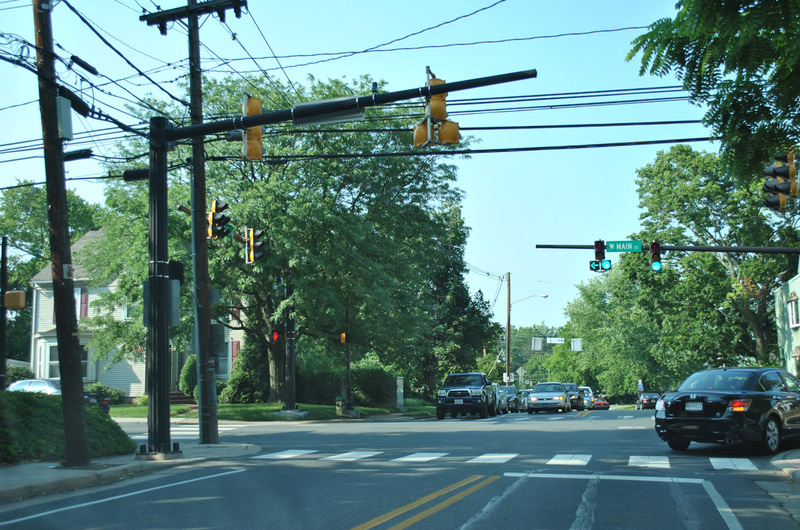 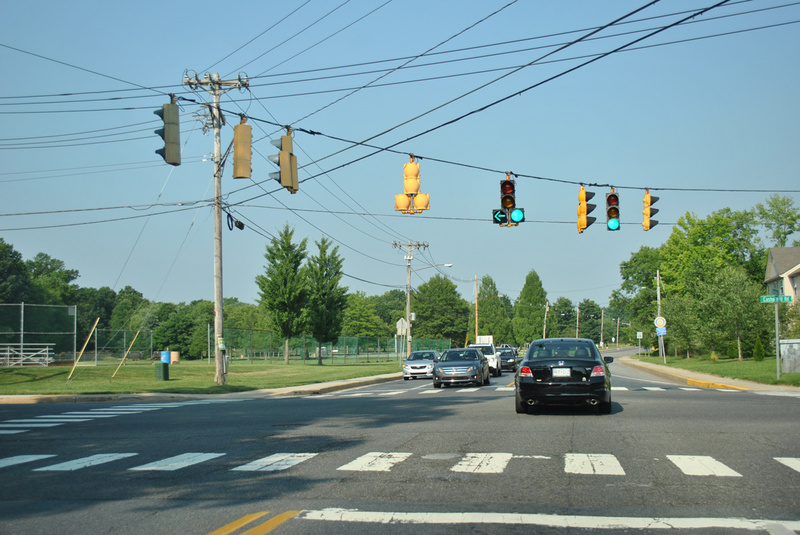 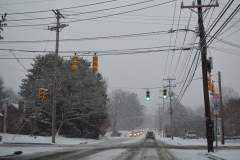 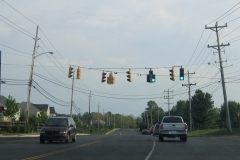 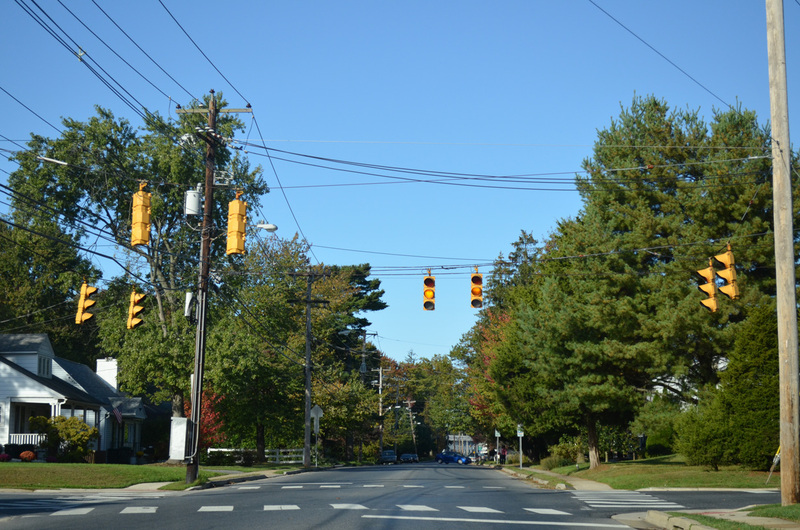 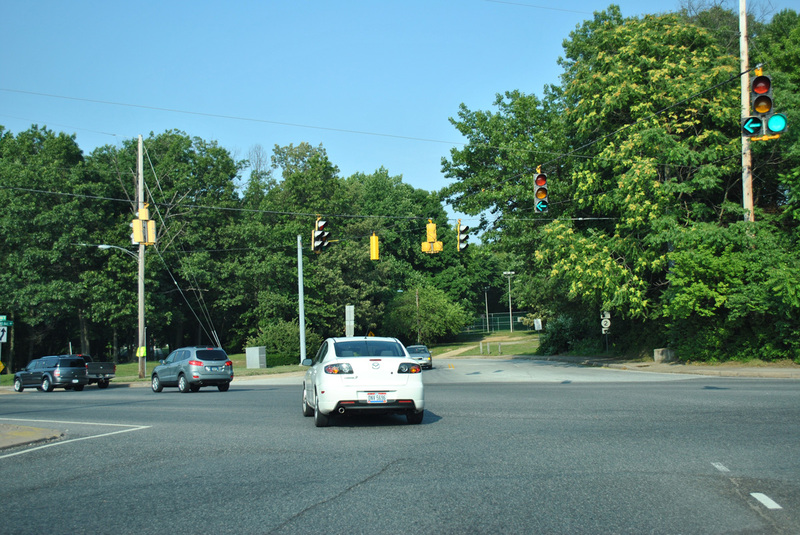 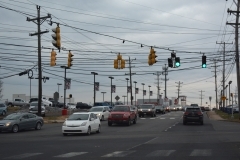 Four signalized intersections are located along Park Place between Elkton Road (Delaware 896) and South Chapel Street. 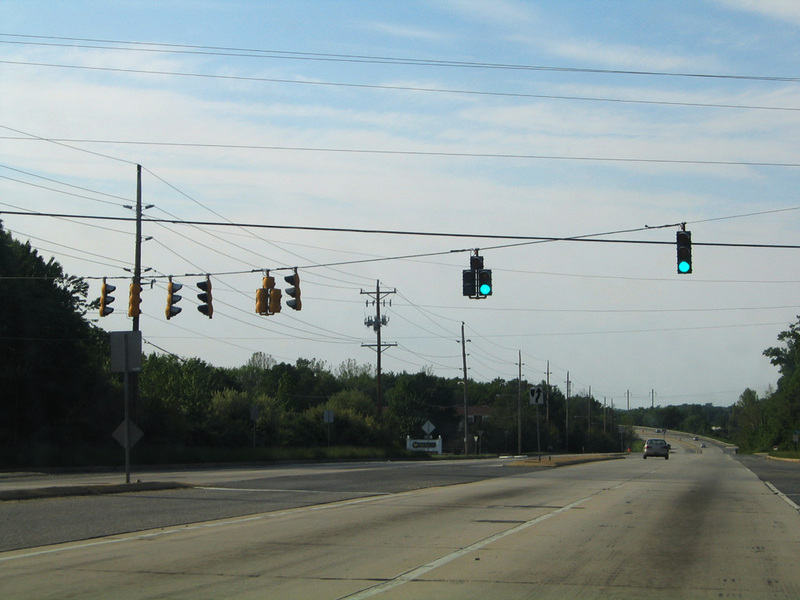 Welsh Tract Road stems east from Otts Chapel Road and crosses Interstate 95 adjacent to the Newark Toll Plaza. 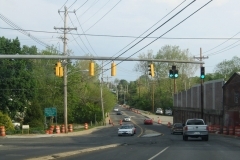 Welsh Tract Road east crosses the Christina River to reenter the Newark city limits ahead of SR 896 (South College Avenue). 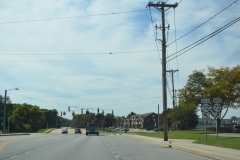 Welsh Tract Road east at SR 896 (South College Avenue). 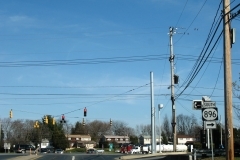 Span wire signals here were replaced with mast-arm based assemblies by 2016. 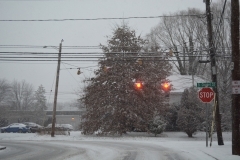 Photo taken 12/18/07. Wyoming Road was built in 1972 as a connector between South Chapel Street (old Delaware 72) and Library Avenue (new Delaware 72). 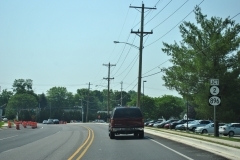 The two-lane roadway was extended eastward in 1999 from Delaware 72 to Marrows Road to provide relief to adjacent Delaware 273 (Ogletown Road). 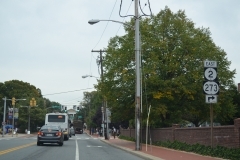 “Learning to be neighbors – Newark and the University of Delaware have experienced growing pains, but are working to forge a better partnership.” The News Journal (DE), April 22, 2002. Page Updated November 14, 2018.